Woodson Mahan, of Washington township, died Thursday morning at four o'clock of Bright's disease and complications. He has been afflicted with the malady for about a year, and for the past two months has been a constant sufferer. The funeral was held Saturday at 2 p.m., burial at Precinct cemetery. Mr. Mahan was born near Danville, Ky., Nov. 10, 1829, and moved with his father to New Winchester, Hendricks county, in 1833, then to North Salem in 1861, then to the farm just north of Precinct twelve years ago. He was married in 1850 to Cordelia Cummings, near Winchester. His wife died some time ago. To this union were born nine children, eight of whom are living, Frank, near North Salem; Mrs. Amanda Weddle, Centerville, Wayne county, Luther, North Salem; Mrs. Amy Page, near North Salem; Wallace, Charles, William and Ona, at home. His grandchild, Woody, also lives on the home place. He leaves several brothers and sisters. Mr. Mahan was a prominent farmer of Boone county, owning 200 acres of land in Washington township. He also dealt in fast horses. Jamestown - Joshua B. MALONE, 76, retired Jamestown post office employee, died Tuesday evening in Witham Hospital, Lebanon. He had been seriously ill one week. Born Oct 4, 1886 at Atterson, Ky, he was the son of Rubin and Anthisie Tucker Malone. Mr. Malone was employed by the post office from 1936 until his retirement two years ago. He transported mail from Jamestown to Advance. His only immediate survivor is a sister, Mrs. Vergie Hiner of Indianapolis. The body was brought to the Walker Funeral Home here where friends may pay their respects after 6 p.m. Wednesday. Funeral services are announced for 2 p.m. Friday at the funeral home. Interment will be in IOOF Cemetery. Carl Mitchell Mantooth, 60, passed away Tuesday afternoon at Witham Memorial Hospital, where he had been a patient since August2, for treatment of heart trouble. Mantooth was well known in Boone County for his interest in politics and was active in the Democratic Party. He was Center 5 Precinct Committeeman for 25 years and was also Center Township Assessor in 1959. He farmed and was an insurance agent in the county and was a member of the Lebanon Eagles Lodge. He had been disabled since 1967 due to his heart condition. He was a member of New Brunswick Church of Christ. Born January 24, 1911, in Washington County, near Salem. Mantooth was the son of S. P. and Flora Ellen (Newman) Mantooth. On November 30, 1935, he married Kathryn Bower, who survives at the family home on Route 4, Lebanon. Surviving, besides the widow, are six children, Max Mantooth, RR 2, Zionsville; Rex Mantooth, RR 1, Lebanon; Mrs. James (Betty Jane) Toney and Mrs. Lyle (Wanda Louise) Giles, both of Brownsburg; and Gary Mantooth, at home. A daughter, Carolyn Sue, died in infancy. Also surviving is a brother, Roe Mantooth of North Salem, and sisters, Mrs. Sylvia Johnson, RR 5, Lebanon; Mrs. Hazel Bowman, RR 5, Lebanon; and Mrs. Ollie Naugle, RR 4, Salem, Indiana. Three sisters, Mrs. Lula Thompson, Mrs. Fern Stewart and Mrs. Nora Bower and a brother, Cecil Mantooth, are deceased. Funeral services will be Monday, conducted at Myers Chapel of Memories at 10:30 a.m. The Rev. Raymond Duff and the Rev. Homer Huntsinger will officiate. Burial will follow at Oak Hill Cemetery. Friends may call Saturday after 4 p.m.
Mrs. Flora Ellen (Newman) Mantooth, Boone County native and mother of Center Township Assessor Carl Mantooth, died Tuesday afternoon at the home of her daughter, Mrs. Buford Johnson, RR 5, Lebanon, at the age of 81 years. After her marriage, she resided in Washington County for many years and reared her family before the death of her husband, Stephen P. Mantooth, January 18, 1927. After Mr. Mantooth’s death, she came to Boone County where she resided in the Elizaville community and has since made her home with her children. Mrs. Mantooth had been ill for the past three years and seriously ill for the last 12 months. Death was caused by a heart attack. She was the daughter of Francis Marion and Mary Jane (McDonald) Newman, born here March 30, 1878. Survivors include two sons, Carl, of RR1, Lebanon, and Roe Mantooth, of Jamestown, as well as five daughters, Mrs. Charles Bowman, of RR 6, Lebanon, Mrs. Harry Thompson, of Spencer, Ind., Mrs. Merl Naugle, of Salem, Ind., Mrs. Johnson, where Mrs. Mantooth died, and Mrs. Phillip Bower, of RR 6, Frankfort. Twenty-six grandchildren and 37 great grandchildren also survive, as do two brothers; Charles Harve, and Gurney Newman, of Lebanon, a sister, Miss Della Newman, of RR 6, Lebanon. Two children are deceased. She had been a member of the Beech Grove United Brethren Church, at Boone County. Funeral services will be held Friday at 2 p.m. in the Myers Mortuary, with the Rev. Raymond Duff officiating. Burial will be in the Olive Branch Cemetery in Washington County, Saturday at 1 p.m. Friends may call at the funeral home anytime. Mrs. Malissa E. Mark, Lebanon, died last Wednesday aged 44 years. Mrs. Martha MARSH, ninety years old, died at her home in Zionsville last Friday leaving an estate valued at $20,000. Mrs. Eliza Jane MURPHY Martin, of Lebanon, died 29 May, aged 81 years. Elmore, commonly known as "Tobe" Martin, died at 9:40 a.m. today at his home 303 East Ash street. His death was due to cancer of the stomach. He had been ailing for three years. His last illness was of three week's duration. Mr. Martin was 67 years, 4 months and 14 days old, having been born Feb.2, 1849. He was married Nov. 12, 1873 near Lizton, Ind., to Mary E. Tolen, who survives. Three children, William, Charles and Jesse Martin, all of this city, survive. Two brothers, John of Missouri, and Link Martin of Arkansas, and one sister of Indianapolis are living. He was a member of the Christian church at Brunswick for many years. The funeral will be conducted at Poplar Grove at 2 p.m. Sunday by the Rev. William Willams. Interment will be in Poplar Grove cemetery. Born in Montgomery County Jan. 3, 1908, he was a son of William R. and Grace Burkhart Martin. He married Marguerite McKinsey in March 1933. She died in June 1970. >> Survivors include two daughters, Mrs. Robert (Rita) Warmoth of Thorntown and Mrs. Judy Ford of Clayton; two sons, Lester F. Martin of Lebanon, and Stephen Dale Martin at home; two brothers, Richard Martin of New Richmond, and Lawrence Martin of Boswell; 11 sisters, Mrs. Silas Mullen, Mrs. Dorothy Winger, Mrs. Helen Gay, and Mrs. Rosalie Booher all of Lafayette, Mrs. Margaret Skeen of Thorntown, Mrs. Louise Hopkins of Indianapolis, Mrs. Marie Guard of Linden, Mrs. Lucy Chambers of Crawfordsville, Mrs. Della Deeb of Rochester, Mrs. Doris Snellenbarger of New Richmond, and Mrs. Mae Smith of Albuquerque, N.M., and 16 grandchildren. Services will be conducted at 2 p.m. Saturday in Russell& Hitch Funeral Home at Thorntown with Rev. Harold Clark officiating. Burial will be in Maple Lawn Cemetery. Friends may call at the funeral home. Levi MARTIN, one of the pioneers of Hendricks County, whose home was east of Jamestown, succumbed to the inevitable and answered the call that all must answer Saturday afternoon at 2 o'clock, 9 march 1901, at the home of his son C. F. MARTIN. Cause of death was bronchial pneumonia, from which he suffered indescribably for near three weeks. The deceased was born in Union County, Indiana, 10 March 1826, making his age nearly 75 years. At the age of seven years  he came with his parents to Hendricks County, then in the wilderness, and when he was married felled the timber in the forest in which he built his home. At an early age he united with the Christian Church of which he strived faithfully to live up to it's teachings until called home. His father and mother were born in Ohio, and he was the third one in his family of 12 children, his brother William at Thorntown and brother Henry C. at Denver City, Colorado are the only ones surviving of the family. In the year 1850 he was married to Emaline FULLEN. To this union was born six children, Charles F. and Horace G. being the ones surviving. Emaline, his wife passed away in the year 1877. His second marriage took place in the year of 1879 to Cassie DARNELL, this union not being blessed with any children. This last companion died in the year 1891, since which time he has made his home with Chas. F.
The deceased was a member of the Masonic fraternity, joining that order in the year 1856, of which he lived and honored and consistent member, and which body took charge of the funeral services. He was known as a straight forward man in all of his dealings, a hard working farmer, and highly respected and honored by all who knew him. He was at one time owner of 200 acres of land, and when he was left with out an companion he divided with his two sons and made his home with Charles. Funeral services were held at the M. E. Church, Jamestown, Monday at 10 o'clock, conducted by Eld. A. L. C____. After which the remains were interred at the Fullens Cemetery, attended by many friends and relatives. Mrs. Mary Ellen Martin died at the home of her son, William Martin, 131 West Noble street yesterday afternoon following a several months illness, death being due to complication of diseases. She was taken ill last October and her condition since that time had gradually grown worse. Deceased was born in Hendricks county September 26, 1860 and was consequently fifty-six years, seven months and twenty-one days old at the time of death. On November 12, 1873 in Hendricks county, when she was a little past thirteen years of age she was united in marriage to Elmore Martin who died June 16, 1915. Three children, Charles, Will and Jesse Martin all of this city survive her. One brother James R. Tolen of this city is also living. A sister and one brother are deceased. Mrs. Martin had resided in Lebanon for eighteen years. Short funeral services will be held at the residence at 9:30 o'clock Saturday Morning. The regular service will be held at Poplar Grove at 12 o'clock noon, Saturday. The Rev. William H. Williams will conduct both services. Burial will be at the Poplar Grove cemetery. Mrs. R. S. MARTIN mother of Fred Martin of this city passed away at her home in Lebanon, Indiana Friday evening Sept 2. Her death was due to complications. Mrs. Martin was born in Boone County March 29, 1853. She is survived by six children 8 grandchildren and one great grandchild. Funeral services will be held Sunday Sept 4 at 2:30 at the Central Christian Church in Lebanon with burial in Oak Hill Cemetery. Funeral services for Robert S. MARTIN, 86, father of Fred Martin of this city will be held at the Powell Memorial Chapel at Oak Hill Cemetery, Lebanon Sunday afternoon at 2:30 o’clock. Burial will take place in the Oak Hill cemetery at Lebanon. Mr. Martin, who was a veteran of the Confederate army, died at Lebanon early Friday morning. Thorntown-- Mrs. Addie M. MATER, widow of O. D. Mater died at 10 a. m. Tuesday in her home here after an illness of several months. A native of Parke County, she was born May 29, 1868. Her husband died in March 1950. She had lived here the last 52 years and prior to that in Russellville. She was a graduate of Bellmore H. S. Survivors include a grandson, Robert Spencer, Thorntown postmaster, and 3 great grandsons, Gerald Wayne, Allen J. and Brian Lee Spencer. Two daughters are deceased. Mrs. Mater was the last of a family of 10. She was a member of the Thorntown Presbyterian Church. Funeral services are announced for 2 p.m. Thursday at Russell & Hitch Funeral Home here with Rev. Paul Mueller officiating and burial in Maple Lawn Cemetery. Friends may call at the funeral home. ded [transcriber error?] him in death. Funeral services will be held Sunday, Jan 15 at 2 p.m. from the Noble Reeves Funeral Home with burial in Pisgah Cemetery in Boone County. Lafayette, July 8 --- HP MATTHEWS, 79, former Lebanon businessman and father of Lyle Matthews died Thursday in Indianapolis at his home, 1648 N. Talbott Street, after a critical illness of 10 days. He formerly was engaged in the hardware business at Lebanon. He was born in Thorntown. After retiring from business at Lebanon he lived in Crawfordsville 4 years before moving to Indianapolis. The funeral will be held in the Lebanon Presbyterian Church Saturday at 3:30 with burial at Lebanon. J. E. Gibson received a paper from Duluth, Minnesota, giving account of E. A. Mattix death. He died Tuesday night of last week, death resulting from being struck by a falling bill board on the evening before, the skull being fractured. The deceased was raised near here by one John Scarry and has been away from here about 25 years and was proprietor of the Lyceum drug store and was heavily interested in real estate at the head of the lakes. He was almost 40 years old and leaves a wife and a 14 year old son. Mrs. Maude Malson of Advance, has gone to Brookston, Ind in response to a message telling of the sudden death of her sister, Mrs. Lula MAUS of that town. Deceased was about 38 and was found dead in bed about 1 o’clock Monday morning. She is survived by her husband, there being no children. The parents of deceased are Mr. and Mrs. William S. Lasley of Gessie Ind near Danville , Ill. She was a member of the Presbyterian Church at Brookston. The funeral service will be held Tuesday afternoon with interment at Brookston. The Lasley family formerly resided at Advance. Thorntown, March 5 – Mrs. Martha Brown McBane, a life-long resident of this community, died at her home Friday night at 11:45 o’clock following an illness of six days. Mrs. McBane’s husband, John died ten days ago. The shock of his death coupled with infirmities of old age caused her death. Mrs. McBane was born in Thorntown on March 5, 1853, a d/o Seth and Alice Brown. Had she lived 15 minutes longer she would have died on her 77th birthday. She was united in marriage to John McBane Aug 2, 1883. The deceased was a life-long member of the Friends church at Sugar Plains. After retiring from active farming four years ago she and her husband resided in Thorntown. Mrs. McBane is survived by two sons, Walter of Frederick, Wil Herbert of near Thorntown; one daughter, Mrs. Alice Berry of Maple, Mn; one brother, William Brown of 3 Rivers, Mi; 3 sisters, Mrs. Cyrena Barker, Mrs. Deborah Macy and Miss Asenta Brown,, all of near Thorntown. Funeral arrangements have not as yet been completed. Bessie S. McLean was born near Jamestown, Indiana 6 January 1886; died near Prowers, Colorado 6 September 1906, aged 21 years and eight months. She united with the M. E. church at Jamestown at the age of ten and was converted and ever afterwards lived a faithful christian [sic] life. She loved to attend church and was a regular attendant at Sunday school. She was a kind loving girl and was loved by all who knew her. She was a suffer of that dreaded disease tuberculosis. For two years she spent the winters in the South, and last March she went with her parents to their new home in Colorado. She leaves a father and mother, two brothers and one sister, a host of friends, and goes to join two sisters, who have gone on before in the last two and a half years. Her remains were brought to Jamestown for burial, arriving at three o’clock Sunday morning and were taken to the home of her uncle. Thos. PORTER, and from there after a short service by her pastor, was taken in charge by the Rathbone Sisters, of which order she was a member, and laid to rest at 1 o’clock on Monday in the Odd Fellows cemetery. Isabell McCoy, daughter of Harvey McCoy of Marion township, died at her home on the Michigan road last Saturday morning, after an illness of but three days with brain fever. She was an interesting young lady, but sixteen years old and the number of her friends may be estimated by the large concourse which attended the funeral. Exercises were conducted at the home church by Rev. Gott, after which the remains were taken to Elizaville for burial -- Bechtell & Son directors. THE PATRIOT fully sympathizes with the family in this hour of so great a bereavement. Cyrus F. McCreight, age 73, a resident of Boone county for the past thirty years where he was a well known and highly respected farmer, passed away at his home at Stringtown, two miles north of Lebanon, Thursday evening at 7:10 o'clock. He had been in failing health for some time with a complication of diseases and his last illness was of five weeks' duration. Mr. McCreight was born in Youngsville, Adams county, Ohio. He was twice married, the first time at Red Oak, Ohio, to Eliza Mannon, who died many years ago. His second marriage occurred January 17, 1900, to Laura E. Kimmel who preceded him in death two years ago. Fraternally Mr. McCreight was a member of the Scottish Rite and Shrine of the Masonic Lodge, Odd Fellows and Red Men orders of Lebanon. He was an active and devoted member of the First Presbyterian Church of this city and for many years served as one of its elders. Surviving him are two children, Frank McCreight and Mrs. Essie McAuley of Galesburg, IL. Funeral services will be held Sunday afternoon at two o'clock at the First Presbyterian church with the Rev. James D. Martin officiating. Burial will be in Oak Hill Cemetery. John McDANIEL, who has been helpless with paralysis the past four years, passed peacefully away, at the home of his daughter, in the east part of town, Tuesday night at 10:30. The deceased was born in Montgomery County, Kentucky 14 October 1832. He came to Indiana with his parents when in his early teens, to Montgomery County, where they located a few miles west of Parkersburg, in which neighborhood he found his wife -- Mary Jane JAMES. After the birth of two children he and the family moved to a farm in Hendricks County, in about the year 1869, and in the year 1872 he moved to North Salem and entered into the drug business, which business he remained in there until the fall of '74 when he moved to Jamestown and took charge of a drug store he purchased here, in which business he has been engaged in up to the time of his disability excepting about one year, at which time he disposed of his store , having sold it. Previous to his sale of the business his store was destroyed by fire. He was the father of eight children, two of whom survive him -- Judson McDANIEL and Lillie OLIPHANT. He was a member of the Christian Church for many years. Short services were held at the home today at 1 o'clock, after which the remains were interred in the FULLEN Cemetery. Samuel Mc DANIEL, an old citizen of this place, died at his home in the south part of town Friday. He had been feeble for some time. He was born in Kentucky 1 October 1827. He was a good comrade and genial neighbor, he leaves many friends. Funeral services were held at the Christian Church Saturday afternoon at 2:30, conducted by Rev. Henry Ashley, after which the remains were interred at the FULLENS Cemetery. McKenzie -- At the family home in this city Saturday morning, February 18, from la grippe, Mrs. Eunice McKenzie, aged 77 years and two days. Mrs. McKenzie was taken ill January 22, and having been in poor health for sometime, the probably seriousness of the sickness was realized and the absent members of the family notified. They remained constant attendants at her bedside until death came. Eunice Higgins was born in Butler county, Ohio, February 16, 1822. When 14 years of age she removed with her parents to Boone county, Indiana, where she resided until her marriage with Mr. B. McKenzie on March 22, 1847. They became residents of Eureka in September, 1885. Deceased united with the Christian church in early life, but when 24 years old she affiliated with the Methodist church, to which she has ever since been a devoted member. She leaves a husband and six children, five sons-John, Frank, Will, Benjamin, and M. G. McKenzie-and one daughter -- Mrs. W. W. Law. Funeral services were conducted Sunday afternoon at the M. E. church by Rev. C. E. Creager. Interment was in Greenwood cemetery. Mrs. Ben F. McKEY, wife of Editor McKEY of the Lebanon Pioneer, died at their home in Lebanon shortly afternoon Monday. Cancer was the immediate cause of death. Mrs. McKEY was a daughter of Mr. and Mrs. John DYSON and was born near Zionsville in 1856, and was married to Mr. McKEY 31 March 1881. The husband and two children survive her. Mrs. Maria McLEAN, aged 92 years, 3 months and 20 days, died at the residence of her daughter, Mrs. E. T. CLEMENTS in Blue Mound, Illinois, 23 July 1901. Her death was due to old age and prostration from heat. Deceased maiden name was Maria JONES. She was born in Greenville, East Tennessee, 3 April 1809, and when 9 years old her parents moved to Union County, Indiana, where at the age of 19 years she was married to Wm. McLEAN. Shortly after their marriage, they moved to Boone County, Indiana, residing there until 1867 when they moved to Westville, Indiana, at which place a year later her husband died. After his death she went to Chicago and was living there at the time of the great fire in 1870. Afterward she went back to the old neighborhood in Boone County and lived there several years, and finally gave up housekeeping and divided her time with her daughters. Mrs. McLEAN was the mother of ten children, six of whom are living. J. W. at Joplin, Missouri, Thomas S. at Alamo, Arkansas, Mrs. Margaret GIBSON at Jamestown, Indiana, Mrs. Anna M. HUDSON, Chicago, Illinois, Mrs. Emily D. COCHRAN, New Haven, Indiana, and Mrs. E. T. CLEMENTS at Blue Mound, Illinois, one daughter, Ellen PIERSOL, died at Westville, Indiana, one son, Albert at Danville, Indiana, and two sons, Samuel and William, were in the Federal Army during the Civil War. Samuel was killed in battle at Port Gibson and William died in the hospital at Gallatin, Tennessee. Deceased was a member of the Christian Church for 68 years and when in her prime was a teacher in the Sunday School and an active helper in all church work. She died in full faith of meeting her loved ones in the home beyond. (Blue Mound Leader [Illinois]). John Franklin McNorton, 71, died Sunday at 8:30 a.m. at his home a mile and a half south of Darlington. He had been a paralytic 16 years. Born in Boone County, he married Cora King in 1893. Surviving are the wife; three daughters, Mrs. Alma Branstetter of Darlington, Mrs. Opal Kimmer, Rossville, and Mrs. Edna Moore of Denver, Colo.; two sons, Merle of Muncie, and Edwin of Lafayette; two sisters, Mrs. Strain of Rockville and Mrs. Overpeck of Chicago; and three brothers, Charles of Gary, Thomas of Clinton and George of Rockville. Funeral services will be held Tuesday at two o’clock from the residence with Rev. A. L. Miller officiating, and burial in the Odd Fellows Cemetery. John J. McNorton, a young man in but his 19th year died at his home in Jamestown last Saturday morning. He had brain fever. One year ago this month he united with the Christian church at that place and had become an active worker in the Sunday-school and Y.P.S.C.E. He had many friends all of whom are made to sorrow greatly on account of his demise. His funeral was preached by Rev. Johnson of this city, after which the remains were laid to rest in the new cemetery at that place. The many friends in Jamestown and vicinity of Albert D. McReynolds were deeply grieved to learn of his death, which, while not wholly unexpected, was at least very sudden. Together with his wife and child, he had gone to Mineral Wells, Texas, starting from Jamestown on 24 October. After reaching Mineral Wells he became worse for a time, after which his physician pronounced him to be out of danger, and his mother left his bedside, returning to her home, some three hundred miles distant. In a few days he suddenly became worse and died at 1:30 o'clock on the morning of 14 November . Albert was born in Boone County, near Jamestown, 23 January 1875, and moved into town with his parents while a small boy, where he received a good education and graduated with high honors, at an early age, from the Jamestown high school. He spent several years in the west, where he met and married Miss Gradelle Wiedner, returning to Indiana in 1896. During his last illness he showed an amount of patience and christian fortitude which gave assurance to those around him that death held no fears for him, and he repeatedly so expressed himself to his wife and said that he was going home to be with Jesus. He selected his old school mates at Jamestown to act as pall-bearers. The remains were brought to Jamestown, to the home of John A. Shelley, where funeral services were conducted by Rev. H. H. Dunlavy in the presence of a large concourse of relatives and friends. Interment took place at the I.O.O.F. Cemetery. A young wife and little son, a mother, many relatives, and a host of friends are left to mourn his death. Thou art gone to the tomb, just in manhood's bright glory. We will miss thy counsel and sweet words of cheer. And while thou art singing redemptions glad story. Thy loved ones on earth will thy memory revere. Tho' sadly we miss thee, we would not recall thee. All trouble and sorrow with thou now art o'er. Thou art safe where no danger can ever befall thee. And we'll meet thee again on the bright golden shore. Lebanon, March 14th – Benjamin B. McROBERTS, 82 prominent farmer and horse breeder and twice sheriff of Boone County died at his home NE of Lebanon today. The widow and 5 children, two of whom are Mrs. Tressie Brouhard and Harvey C. McRoberts of Indianapolis are survivors. Last rites will be held Sunday afternoon. Myrtie May WHITELEY, daughter of Enoch and Martha WHITELEY, was born 6 June 1874, and died 31 October 1906, aged 32 years, 4 months and 25 days. She was married to George MCVEY 8 September 1895. She leaves a sorrowing husband, one daughter, Gladys, a father, mother, two brothers and one sister, besides many loving friends to mourn her loss. She united with the Methodist Protestant church at Mt. Zion in March 1890. She possessed a happy cheerful disposition, was a loving daughter, wife and mother. She suffered greatly but was very patient during the last few weeks of her illness. She has laid away the body of flesh and pain and entered into her rest. Her pure spirit is with the Lord and she awaits the coming of those she so fondly loved, and unselfishly served in her home. Peaceful be her sweet rest. Funeral services were held at Mt. ZION, Rev. D. W. EVANS, of Elwood, conducting the services. Burial at Mt. ZION. Mrs. Sarah Charlottie Metzger, age 63 years, a lifelong resident of Boone county, expired at her home, 515 South Lebanon Street, at 10:30 o'clock Tuesday night following an illness with carcinoma which dated back to February, 1924. Mrs. Metzger was born in Harrison township. She had been a resident of Lebanon for the past eight years. She was married in 1896 to O. J. Metzger, who survives with the following children: Mrs. Icy Shera, of near Advance; Ona Rader, of near Lebanon; Mrs. Nora P. Williams, of Lebanon; Carl Rader, of Ben Davis; and Blanche Turner of near this city. Also surviving are one step-daughter, Maude Lawler, of near Lebanon; one brother, Edgar Woodard, of Boone county; two half-brothers, Lennie Dinsmore of Portland, Oregon, and Frank Dinsmore, of Sidell, Illinois; one sister, Mrs. Rosa Yingst, of Lebanon; one half-sister, Emma Patterson, of Sidell, Illinois, and eleven grandchildren. She was a member of the Christian church at New Brunswick. The funeral services will be conducted from the residence Thursday afternoon at 2 o'clock, the Rev. John M. Horne officiating. Burial will be at Oak Hill. Note: "This person was married several times. She was born Sarah Charlotte Woodard. She married a RADER, then CUNNINGHAM, and then a METZGER." Death has visited another happy home and taken away the mother so dear to her home companions. Mrs. John Miller, southwest of New Ross, was carried away by the death angel to the happy home across the River of Death Friday. Rev. Will Anderson of Ladoga conducted the funeral services at the house Sunday morning at 10 o'clock, after which she was laid beneath the dust in the Hashbarger Cemetery. She leaves a husband and daughter to grieve their loss and many friends. Daughter of Isaac and Elizabeth Dye, born March 12, 1840 and died March 12, 1896, age 56 years. Married Jonathan R. Mills, Aug. 7, 1862. To them were born five children, four of whom are living and with the father are left to mourn her untimely death, viz; Alonzo Mills of Lebanon, Ingram and Ida Mills, Northfield and Mrs. Ella Deer of Big Springs. The deceased was a devoted Christian, having embraced the cause in her youth. Her death was caused by chronic stomach trouble, aggravated by an attack of lagrippe. Her remains were interred in the Little Eagle cemetery. Rev. I. N. Land preached the funeral discourse from the text found in 11 Timothy. 4-8. Washington, November 5 -- Brigadier General Anson Mills, retired, died here today. Born in Boone county, Indiana, August 31, 1834, he was a veteran of Indian and civil wars. He invented the woven cartridge belt and loom for its manufacture used in the American army and navy. Washington, Nov. 5 -- Brigadier Egan Anson Mills, retired, died here today. Born in Boone county, Indiana, Aug. 31, 1834. He was a veteran of Indian and Civil wars. He invented the women [sic] cartridge belt and loom for its manufacture used in the American army and navy. Note: "Burial Little Eagle. Angeline Dye, first wife was daughter of Isaac Dye. Mr. Mills was an uncle of John Mills of Zionsville." Louisa J. Mills - Daughter of John and Charity Fouts, was born in Marion Co., near Clermont, Ind. Aug. 30, 1838 and died at the Soldiers Home near Lafayette July 5, 1928, age 89. Mrs. Mills Moved with her parents when only a child to Boone Co. near Zionsville and lived in this community until she moved to the Soldiers Home about one year ago. Mrs. Mills was married to John W. Eastep, Dec. 2, 1859. To this union was born one son John Wesley, both of whom preceded her in death. Mrs. Eastep was married to Bennet Taylor, Mar. 25. 1884. Mr. Taylor died July 11, 1890. Mrs. Taylor married to William J. Mills in Aug 1892. Mr. Mills died March 1, 1903. Mrs. Mills was baptized into the Lutheran church when only a child. She leaves one brother David Fouts, two step sons John M. Mills and W. O. Mills. Transcriber Note: Handwritten at the bottom by my grandmother; "Buried at Zionsville Cemetery." Wife of W. J. Mills and mother of John M., T. P. and William O. Mills. Born in North Carolina May 8, 1825 and came with her parents to Washington County Ind. About 1833; moved from there to Hamilton County about 1836 and lived in Hamilton and Boone until her death, Nov 26, 1890. She joined the Methodist church at Sugar Grove meeting house about 45 years ago. Married W. J. Mills July 29, 1847. Buried Little Eagle. Uncle Billy, as he was familiarly known, died at home in this place Sunday. He was born in the State of Tennessee, Feb. 14, 1824. He remained there until about 12 years of age, when with his parents he moved to Rush Co. Ind. where he remained but a short time, moving from there to the western part of Hamilton Co., Ind. He married to Maria Swaim July 29, 1847 and to this union three children were born, John M., Trougott P. and William O., all of whom are still living. He moved with his family to Zionsville in the year 1857 and has resided in Zionsville and the immediate vicinity up to his death, which occurred March 1, 1903. He enlisted in the 54th Indiana Infantry in 1862 and served fifteen months, when he was discharged and re-enlisted in the 150 Indiana serving with this regiment until the close of the war. His wife, Mariah, died Dec. 26, 1890 and in August 1892, he was again united in marriage to Louisa J. Taylor, who survives him. Interment at Eagle Creek Cemetery. Source: Crawfordsville Journal Review 14 Nov 1968 p 14 typed by Walt W THORNTOWN — Joseph K. Milner, 96, a former resident of Thorntown, died at 2:20 p.m. Wednesday in Oak Park Manor Nursing Home at Lebanon. He had been in failing health two years and seriously ill three weeks. Mr. Milner was born Aug. 25, 1872, a son of William and Harriet Hollingsworth Milner. His first marriage was to Ada Stubbs, who died in 1935. In 1938 he was married to Nellie Pendergrass, who died in 1953. He was a member of Sugar Plains Friends Church in Thorntown. He belonged to the Chester White Swine Breeders Association and had judged hogs at various fairs. He had a stock feed concession at the Indiana State Fair for 14 years. A farmer his entire life, he made his home with his daughter in Plainfield the last six years. Survivors include a daughter, Mrs. Asher Craig of Plainfield, and a granddaughter, Mrs. Robert L. Simms of Tulsa, Okla. A brother and three sisters are deceased. Funeral services will be held Friday at 2:30 p.m. at Russell and Hitch Funeral Home in Thorntown with Rev. Lorten Heusel officiating. Burial will in Sugar Plains Cemetery near here. Friends may call at the funeral home. Guy Edward MITCHELL died at 3:30 yesterday at his home 810 John Street . He was 22 and had been suffering from a severe case of tuberculosis for over a year. The young man was born near Jamestown but moved to this city and has lived here most of his later life. He joined the US Navy when he was very young and only last year received an honorable discharge from that department. He returned to Crawfordsville and has been in the city since that time most of the period being in poor health. He was a member of the Christian Church of this city, belonging to the loyal Sons a group of workers in the church. He leaves besides the father, Mr. George W. Mitchell and his mother, 3 brothers and one sister. The arrangements for the funeral have not yet been completed. Thorntown, Ind., Sept. 18 -- Mrs. Martha Moffitt, wife of Joshua Moffitt, a prominent citizen, and a former President of the First National Bank of this place, died yesterday morning of typhoid fever. She was fifty years and seven months of age. Merlin MOON died at Cartersburg, Sunday. Mahala Howard was born near Dayton, Ohio, on January 26, 1826, and died in Zionsville at the home of her daughter, Mrs. Mary A. Klingler, Saturday, Nov. 2, 1901. She was married on Sept. 17, 1848, to Samuel M. Moore. to this union were born eight children - two sons and six daughters - of whom two daughters have preceded her to the better world. In 1858 she, with her family, removed to Boone county, Indiana, where she has since lived until her death. She was a member of the German Baptist church, having united with it some fifty years ago. She was a true, noble woman who never shrank from a single duty. She was always ready and willing to help those who were sick or in distress. Many a heavy heart has been cheered and many an aching head has been relieved by her kind words and helping hand. But her work on earth is done. Her tired hands are folded. She is asleep; asleep in Jesus. Oh, how many an aching heart is left to mourn this loved one. Her place can not be filled. though it is so hard to give her up, yet "God's will be done." She was a woman whom "None knew her but to love her, None named her but to praise." The obsequies were conducted at Salem M. E. church last Monday afternoon by W. G. Vessels. Samuel Moore, an aged and respected citizen residing west of town, died Monday evening after a lingering illness. He was 82 years of age. Mrs. Klingler, of the Klingler House of this place, is a daughter of the deceased. Funeral and interment at Salem yesterday. Chas. E. MORRISON, a young farmer north of Crawfordsville, died Sunday night. He leaves a wife and one child. Note: I am posting obituary for others. I am not related to the subject. No other information was given. This was an edited text. Elijah MOUNT was born in Hardin County, Kentucky, 24 February 1832 and died 9 January 1905 aged 72 years, 10 months and 16 days. He were [sic] married to Melinda McIver 21 August 1856. To this union was born five children: Margaret L., John W., Isabella, Hortense and Josephine, three of whom with his wife have preceded him to a better land leaving John W. and Hortense CLICK with their companions, five grandchildren and numerous relatives and friends to mourn their loss. He united with the M.E. church when about fourteen years of age and was a loyal member until his death. The funeral services were held at the home of his daughter, Mrs. Hortense CLICK, southwest of Jamestown, Wednesday morning at 10 o’clock, Rev. SHAFFER of Lizton, officiating. Interment at Bethel cemetery, northeast of Roachdale. Better known as Tobe, died at his home on Michigan Road, east of this place after a short illness of kidney trouble. Son of Richard Jackson Muston and Elizabeth Muston, was born near Eagle Township, Hamilton County, May 1, 1883, and died at his home on May 17, age 34. He was the 8th of ten sons, and always had to work hard to support himself and do his part in the large family. Married Dec. 22, 1906 to Miss Myrtle Bland. His father died about six years ago but his aged mother is still alive. Survived by wife and three children, Richard Alden, Franklin Adrian and Paul Edwin. Nine brothers: Joseph William Clark, Pearl Muston and Oliver M. Muston, of Lebanon; James David Clark of Whitestown, Charles Muston of Zionsville, Calvin Alonzo Muston, of Thorntown, Perry Muston of New Augusta, Cyrus Muston of Eagle Village and John Muston of Salina, Kansas. Burial at Eagle Creek Cemetery. Residing in the Old Taylor farm, east of town, died, January 22, 1909. He was born in North Carolina, July 16, 1830. The funeral occurred Sunday with interment near Eagletown. Jas. A. NAY, a well known farmer residing five miles south west of town of Lebanon, died Tuesday of complications of diseases of an extended illness. He was seventy-four and one day old. LEBANON, Ind., June 23 -- Judge Stephen Neal author of the Fourteenth Amendment to the United States Constitution died here this afternoon in his eighty-eighth year. He had been ill for several weeks but was conscious up to a few moments before death. When the question of amending the Constitution was under discussion soon after the civil war, Judge Neal, who then resided at Lebanon wrote out the fourteenth amendment and sent it to Godlove S. Orth, Congressman from the Lebanon district, saying that it was submitted as a suggestion. In a few days he received a reply from Orth saying that he had submitted the amendment to the committee and that it had been agreed to report it practically as submitted. LEBANON -- Mrs. Allison Franklin Neese, 47 years old, died suddenly of heart disease. The husband and five sons, two of whom are in France, survive. The family recently moved here from Whitestown. Mrs. Neese's body was found by a son when he returned from school. Last rites for Bert C. Newman of this city will be conducted at 3 p.m. Tuesday in the Russell and Hitch funeral home with Rev. P.J. Hamilton in charge. Interment will be at the Shannondale cemetery. Mr. Newman died at 3:15 Saturday in the Witham hospital where he was admitted early the morning after suffering a stroke at his home, 712 Barrone Street. He has lived in Lebanon since 1945, when he retired from the Northern Indiana Public Service Company after 30 years' service. The past three years, Mr. Newman had been custodian of the Centerary Methodist church. He was a member of the Central Baptist church at Gary. A native of Crown Point, Mr. Newman was born November 14, 1878. He was the son of George P. and Polly (Davis) Newman. His first marriage was November 15, 1908, to Emma Rhoten, who died in 1922. In November, 1923 he was married at Crown Point to Byrda J. Madison, who survives. He also leaves four sons, Bert L., Harry and Richard Newman of Gary, and George Newman, New Castle; two daughters, Mrs. Leroy Kettrey, and Mrs. Clarence Hand, both of Lebanon; two step-sons, Maurice Kincaid, of Sturgis, Mich., and Jewell Kincaid, of Gary; three brothers, William and Charles of Hammond and Doll Newman of Crown Point; a sister, Mrs. Robert Evans of Hammond; 18 grandchildren; and three great-grandchildren. Two brothers preceded him in death. Friends will be received at the Russell & Hitch funeral home anytime. Note: Bert Newman died May 7, 1955. Mary Elizabeth NICHOLSON, died at her home in Jamestown Thursday afternoon, 21 March 1901, aged 71 years six days. She was born in Johnson County, 25 March 1830. She was married in the year 1853 to Daniel WATSON, which husband was killed in an railroad accident about a year after. In the year 1865 she married Wm. NICHOLSON. To the latter union was born one son, John. This union did not prove to be agreeable and there was a separation about a year after, which remained severed. The last husband died about three years ago. She was a resident of Jamestown about 26 years, and was a member of the Methodist Church since early girlhood. Funeral services were held at the M. E. Church Friday afternoon, conducted by Rev. RIPPETOE. Remains were interred in the I.O.O.F. Cemetery. The death of John NICHOLSON's wife early Sunday Morning was a surprise to the community, she not having been seriously ill until in the early part of Saturday night, although she had been sick about 10 days. Paralysis was immediate cause of death with a complications of other troubles. Myrtle May, daughter of Wm. [MAY] and Nancy A. WHITE, was born 9 December 1878, and departed this life, at her home in Jamestown, Sunday morning, 19 May 1901; aged 27 years, 5 months and 10 days. Although not in good health her death came as a shock to all. Her grandmother, mother, one brother and husband survive her and mourn their great loss. She was united in marriage to John NICHOLSON 28 August, 1899, and was faithful and affectionate wife, sharing with him the care of his aged and affectionate mother until her decease, which occurred 21 March, 1901. Funeral services were conducted in the Methodist Church by Rev. Cornelius AIRHEART of the Baptist Church, assisted by Rev. O. B. RIPPETOE, after which the remains were laid to rest in the Odd Fellows Cemetery. Born near Jolietville, the daughter of Mr. and Mrs. Frank Bland. Her mother died about 16 years ago. She was one of six children, four of whom survive, Dave, Paul and Elmer of Indianapolis and Zionsville and Mrs. Edna Moore of Peru. Mrs. Nicum leaves six children, three by her first husband and three by her second husband. They are Adron Muston of Sioux City, Iowa, Paul and Alden Muston, Edna, Katherine and John Nicum. Member of the Zionsville Meth. church. Harriet NORRIS, daughter of Samuel and Lettie VERBRICKE, was born in Danville, Indiana, 20 September 1839, and died at the Soldiers Home at Lafayette, Indiana 15 September 1905, aged 65 years, 11 months and 25 days. She was married to C. R. HARPER, 15 October 1861, and he was killed in battle in the Civil War. 12 March 1866, she was married to J. T. BURHOP, who was also a soldier in the Civil War. To this last union were born four children as follows: Geo. V., Flora E., Lettie and Miriam, all of whom have preceded her to the other side. About 1869 they moved to Jamestown where Mr. BURHOP was engaged in the undertaking about 60 years. He died several years ago. Mrs. BURHOP leaves as immediate relatives one sister, Mrs. Flora EASTES, of Russell, Iowa, and one granddaughter, Miss Jessie MILLER, of Jamestown. The remains were brought to Jamestown and the funeral services were held at the home of W. H. MILLER, Sunday afternoon conducted by Rev. NEWLIN. Burial at I.O.O.F. cemetery. Riley Northcutt, age 65 years, passed away at his home one mile southwest of Jamestown, this morning at 1:05 o’clock. He had been in failing health for the past ten weeks but had been confined to his bed only five days. He was born in Boone county and resided here practically all his life. About four weeks ago he moved from the Old Union neighborhood, southwest of Lebanon, to his late home in Hendricks county. He was married August 19, 1892, In Clermont, Ind., to Ida Homiare, who survives. Besides the widow he leaves three children, Howard Northcutt and Goldie Roseboom, both of Boone county, and Clara Loveless of Hendricks county, one brother, Roy Northcutt and four sisters, Phebe Ann Hiland, Eliza Hiland and Martha Graham of Boone county, and Harriet Hiland of Hendricks county, and eleven grandchildren. One daughter, one brother and three sisters are deceased. Mr. Northcutt was a member of the Christian church at Old Union where the funeral services will be conducted Sunday afternoon at 2:30 o’clock with the Rev. Leland Plew of Jamestown officiating. Burial will be in Old Union cemetery. R. A. Oliphant was born near Lebanon, Indiana, 24 November 1856; died at his home in Jamestown, Indiana, 26 February 1899; aged 42 years, three months, two days. The deceased leaves a wife and two small sons, with other relatives and many friends to mourn his departure. Deceased was married to Lissie McDaniel 11 January 1881, three children were born to them - two sons and one daughter, the latter having preceded him to the beyond. Deceased lived in this community since his boyhood and was known as a honest and industrious man. By his industry and toil he helped to build up a nice little home for his wife in the northeast part of Jamestown. He had been a member of the Christian Church for about twenty years, at one time withdrawing from the church, but in the last few years reunited with it and died in the faith. He rapidly declined in health since last Christmas and in the last few weeks was confined mostly to the house, but not to the bed till the last few days before his death came. Funeral services were held at the home Monday at 8 o'clock, conducted by C. F. Martin, attended by many friends. Interment immediately after, at the LOWRY Cemetery. Mrs. Ellen O'NEAL, 90 years old, widow of Abijah O'NEAL, died at her home in Yountsville last Saturday. She was the mother of eleven children only four of whom are living. She and her husband settled in the wilderness and endured all the hardships of the pioneer days. They were also severely persecuted and threatened by the Knights of the Golden Circle during the Rebellion and it was thought Mr. O'NEAL's efforts that the order in that neighborhood was broken up. Mr. O'NEAL died in 1874. Coordinator Note: The Knights of the Golden Circle (KGC) was a secret society originally founded to promote Southern interests and prepare the way for annexation of a "golden circle" of territories in Mexico, Central America, and the Caribbean which would be included into the United States as southern or slave states. During the American Civil War, Southern sympathizers in the North, known as "Copperheads," were accused of belonging to the Knights of the Golden Circle. William Ottinger suffered the loss of his little girl last Saturday. She died of typhoid fever. The funeral took place Monday at 10 a.m., at the old Lutheran grave yard. — Mrs. Irene Owens, 56, died Saturday night at her home here after an illness of four years. She was a member of the Jamestown Methodist Church. A native of Hendricks County, she was born April 17, 1911, a daughter of Omer and Essie Groover Gossett. She married Glenn Owens in Indianapolis June 9, 1931. Surviving along with Mr. Owens are four daughters, Mrs. Janet Whitaker of Plainfield, Mrs. Sue Martin of Lizton and Judith and Jean Owens, both at home; two sister, Mrs. Halcie Wilson of Plymouth and Mrs. Doris Martin of Crawfordsville, and two granddaughters. Funeral services will be held at 10 a.m. Tuesday at Walker Funeral Home. Burial will be in Old Union Cemetery. Friends may call at the funeral home. Lebanon Reporter - Jesse C. PARKS, a Civil War Veteran passed away at his home on west Busby Street a 8 o'clock last night after an illness of 3 years. He was born in Putnam Co May 22, 1845 and was therefore 73 years 7 months and 29 days at the time of his health. He was married to Martha Mullen who died March 4, 1879. Two children, Allen To [sic - transcriber error?] and Perry W. Parks survive. One brother, John Parks of Putnam Co and 3 sisters, Rebecca Parks, Mahala Swope and Lydia Wagoner survive. Deceased served in the 139th regiment Indiana volunteer infantry. Ora PARR of Lebanon, died last Friday. He was about twenty two years of age and was married. Sanford Parrigen who was born 91 years ago in Henry county Kentucky, passed away a little before six o'clock yesterday evening at his home in Union township after an illness of three weeks. Mr. Parrigen was married twice, first time to the late Harriet McConnell and after her death to Georgetta Jones. The deceased was a member of the Methodist church. The funeral was held at the residence at nine-thirty o'clock this morning, the Rev. Simonson officiating. Burial was in Center cemetery. The following children survive: Mrs. Lizzie Benson near Waugh, Mrs. Emma Harrison near Sheridan, David Norman Parrigen near Gadsen and Ray Edward Parrigen near Sheridan. The little 18 months old daughter of Alva Patterson died at nine o'clock Monday night of lung and catarrabal [sic] fever. She was sick only about four days. Burial took place Wednesday forenoon at the Fullen Cemetery. Jamestown March 7- Word was received yesterday of the death of Horace PATTERSON of Chicago. The deceased who formerly resided here had for several months been employed in the CH & D RR yards of Indianapolis. Sunday being his 21st birthday he decided to spend it with his parents, Mr. and Mrs. Wilburn Patterson of Chicago. Just as he stepped in the door he fell dead with heart trouble. Mr. Patterson was a grandson of Mrs. Amanda Camplin of this place and was widely known here. His body will be brought to Indianapolis Tuesday for burial in Oak Hill cemetery. Lucinda Patterson, daughter of Emanuel and Hulda Amick, was born in Hancock County, Indiana, 24 November 1843, and died 15 April 1909, having lived 65 years, 4 months and 21 days. Was married to Cyrus Patterson on New Years Day 1866. To this union were born three daughters, and one son. Alva who is the only surviving member of the family. She had lived for more that forty years in this immediate neighborhood, and her life was an open book, from which all could read and none dare criticize. She united with the Christian Church, in Danville, Indiana. At the age of nineteen and lived a consistent Christian to the end of her life. Her's was always a ministering hand in the home of sickness and sorrow, and while she saw and realized that the old grim monster, consumption, was daily stealing her life away she never complained, but patiently awaited the death angel's coming. So we will not think of her as dead, but, just gone away. Funeral services were conducted at the house Friday afternoon, Bro. C. F. Martin officiating. Burial at Fullen Cemetery. General Robert PATTERSON, whose death in Philadelphia was recently recorded, celebrated his 89th birthday on the 12th of last January. He was a native of County Tyrone, Ireland, but came to this country with his parents when he was a mere child. He enlisted in the war of 1812, and served with such credit that he was made Captain when it closed. He then returned to the mercantile pursuits. Until the Mexican was began [sic] his life was uneventful. When that war broke out he had long been a Major General of militia, and his appointment as Major General of Division in the volunteer army was recognized by everybody as eminently fitting. He entered and occupied Jalapa, and at Cerro Gerdo led in person a storming party against the Mexican intrenchements [sic], for which he was honourably mentioned in the dispatches. After the war, Gens. PATTERSON and Franklin PIERCE became warm friends, and the former was known to be a power behind the throne during PIERCE’s administration. Gen. PATTERSON was a conservative Democrat, and his friends insist, a fervent loyalist during the war. But, owing to his fault or his misfortune, he did not hold Gen. JOHNSON’s forces in the Shenandoah Valley, and the disastrous battle of Bull Run, which followed, closed forever his military career. Gen. PATTERSON held many honorable civic and business positions, but never a political office to which an emolument was attached. He had made it a principle of his life that he should not take to an office of profit, or allow his son’s to do so. He was a highly-honored citizen of Philadelphia. David M. Patton, a native of Bourbon County, KY, where he was born 64 years ago, died at an early hour on last Thursday morning, at his home, 523 Powell St., Lebanon. His death was due to catarrh of the stomach & complications resulting there from. He had been ill more than a year. Mr. Patton was married 35 years ago to Sarah E. Lofting in Putnam Co., IN. The children surviving are: Walter M., of this city; Mrs. Ella Lumpkins, of E. St. Louis; Charles V., of E. St. Louis, and Mrs. Nannie Hazelrigg, of this city. He also leaves a brother, John Patton, of Millersburg, KY, and one sister, Nanie A. Patton, who has been residing with him in this city. Mr. Patton moved to Lebanon from Putnam Co. IN, 12/5/1883, and had been in the contracting business ever since he had been a resident here. He was a member of the 1st Presbyterian Church of this City. The funeral was held at the residence at 10:00 am Saturday (9/20/1908) and was conducted by the Rev. O. H. Carmichael. Burial was at Oak Hill Cemetery. This community was much surprised Monday when the word came that Ashbury Penry was dead, and especially was it a great shock and surprise to his brother here and his many friends. Just one week and two days previous he had left here in his usual health, having spent a week here visiting his brother Samuel and old friends, which visit he and Samuel said they had enjoyed more together than for many years. Leaving here he went to Indianapolis to stay with his daughter there for a while, but on the day he left he got wet in the rain and 'tis supposed he took his death cold from that, as on Wednesday, 27 April, four days later, he took sick and on Friday was compelled to take to his bed, and on Sunday morning , 1 May, at 4:30 o'clock he passed peacefully away in the presence of his daughter, Mrs. William Randal, and family, at 323 West Maryland Street. William Asbury Penry was born in Roan County, between the forks of Adkins Rivers, North Carolina, 1 February 1818; died in Indianapolis [Indiana] 1 May 1898; age 80 years and 3 months. About two years previous to leaving his birthplace his father died, and on 1 March 1831, he with his mother and two brothers - Samuel and Daniel - left there and moved to Clairmont [sic] County, Ohio, on the Ohio river. There he and mother and Samuel lived together in one house and Daniel, who married before leaving North Carolina, lived in another. After living in Clairmont [sic] County 17 months the three moved to Union County, Indiana, and wintered there in the years 1832- 1833, then moved to Hendricks County, Union township, on 19 August 1834. There he married Susan Davidson 7 May 1846, and to them were born one child before moving to Jamestown [Indiana], which child died young. Moved to Jamestown in the year 1848, where nine children were born and reared - Mary, Emaline, James, Elizabeth, Sarah, Maggie, George, Nancy and Frank, seven of whom survive him, James and Nancy being dead. On the 12th September 1876, his wife departed this life. Remaining single two years he married Rachel Johns, widow of Joseph Johns, after which he moved to the country, two miles northwest of town, and lived on her farm until January, 1894, when she died. Then in May 1894, he broke up housekeeping and went to live with his daughter Maggie and son George at Terre Haute, and from that [time] on lived alternately with his children there and at Hartford City and Indianapolis until his death. At the time the Big Four railroad was built, which was then the Indianapolis & Crawfordsville line, he kept the largest boarding house in town, the house now owned and lived in by Miss Lyde Pratt, at the time boarding many of the men who helped build the rail road. And before the road was completed it went into the hands of a receiver, and the men not being able to get their pay kept Mr. Penry from getting his board bills for five years afterward. This broke him up and he had to go out of business. While Asbury was on his last visit here he and Samuel had their photographs taken together, which is very much prized by Samuel as a touching token of remembrance. Samuel was much moved at the unexpected death of his brother, and he is now the only one left of that family. The deceased was sick only four days, passing away in the faith of the Redeemer. He was a kind, gentle father and husband and pleasant, inoffensive neighbor. He was a member of the old Methodist Church. His brother Daniel preceded him in death in the year 1847 and his mother in 1872, the latter's age being 82 years. Funeral services occurred at the old cemetery here, Tuesday afternoon, the remains arriving on the 12:39 train from Indianapolis, immediately on arrival of which the Free Masons of this place took charge and conducted a very impressive service at the grave. He was a charter member of the F. and A. M. order of this place, only one which John Troutman - now survives. Among those who attended the funeral were Emaline Randel, a daughter, and her husband; Mrs. Randel's son Charles, Mrs. Randel's daughter Ann Larsh, a widow; Maggie Davidson, a daughter, and her daughter Pearl and son Harry, all of Indianapolis; Mrs. Elizabeth Maines, a daughter, of Hartford City; George Penry, and a little son of Terre Haute, all of whom accompanied the corpse; and Mary Dickerson and husband of Waynetown. Ira S. PERKINS died Tuesday night at his home in Lebanon from the effects of a stroke of Appoplexy [sic] suffered two weeks ago. He was born in this county 25 November 1841. He leaves a widow and three children. He also was a member of the G.A.R. and Red Men orders. Mr. PERKINS has lived in Lebanon most of his life. The funeral services will be conducted today at 10 o'clock by Rev. TILLOSON. Burial at Oak Hill. Mr. PERKINS is a brother- in- law of J. H. STEELE of Jamestown and was quite well known here. One of Greene County's Most Highly Respected Citizens. John W. Perkins son of Mr. and Mrs. Robert Perkins was born in Lebanon, Boone County, Ind. July 21st, 1854 and died at his home in Grand Junction, Iowa September 14, 1924, age 70 years, 10 months, and 24 days. He was married to Margaret Curtis in February 9, 1879. To this union 8 children were born, six boys and two girls. Mr. and Mrs. Perkins came to Iowa February 11, 1890 and settled on the farm near Grand Junction and lived there until 1911 when they retired from the farm and moved to Rippey and later to Grand Junction. He professed Christ as his Savior in early life. He united with the New Light Church and lived in this fellowship until 1894 when he with his wife united with the Beaver Baptist Church. He served this Church as Deacon until he came to Grand Junction when he moved his membership here and remained a faithful member until his death. He leaves to mourn his going his wife, one sister Eliza A. Harding of Ind., four sons and one daughter, six grandchildren, five boys and one girl. Funeral services were conducted at the Baptist Church and rites at the cemetery conducted by the Modern Woodmen of American, Rev Treloar[? ], Rev McDonald, and Rev Osborn were in charge of the obsequies. Note: John W. Perkins was the s/o Robert B. Perkins and Louvina Bennett. Nathan Anvil Perrill, one of the earliest settlers of this community, died at his home in this city, Saturday evening, Oct. 13, and his death revives some of the incidents of pioneer days. The Perrill family was very closely identified with the early history of this community, the father, John Perrill, having come here in the spring of 1856. The eldest son, Joseph Price Perrill, surveyed the original town-site of Burlingame for Phillip Schuyler and S. R. Caniff. Two years later, or in 1858, the subject of this sketch and his brother, George, arrived here from Ohio, having walked out the the Old Santa Fe Trail from Westport Landing, now Kansas City. The deceased was born in Brown county, Ohio, January 6, 1844, and following the death of his mother, came West at the age of fourteen years. Kansas was thereafter his home until 1877, with the exception of three years spent in the army. He returned to Ohio to enlist, serving in the 18th Ohio Battery, Army of the Cumberland. After the war he returned to Kansas settling at Arvonia, near Reading, on the Marais des Cygnes. He was there at the time of the organization of the township of Arvonia filling at different times the offices of treasurer and justice of the peace, and assisted in the organization of the Congregational church at Reading. He was also elected to the Legislature from Osage county in 1873 and again in 1875. He was married to Miss Ellen Conn of Ripley, Ohio in 1871, her ill health causing him to return to the East with his family six years later. Five children were born to this union, three of whom are now living; Commander Harlan Page Perrill of the U. S. ship Yorktown, now in the navy yards at San Francisco; Miss Harriet Louise Lang of Manchester, Ohio, and Margaret Faye Boyer, Calexico, Calif. His first wife died in 1885. For almost thirty years he was a resident of Boone county, Ind., where he filled a large place in the religious and business life of its county seat, Lebanon. He was deputy county treasurer for two terms, and twenty consecutive years was justice of the peace at Lebanon. His marriage to Mrs. Helen A. Sloan, formerly Miss Helen Crumb and a friend of early days occurred here in 1914. For two years they resided in Lebanon, since which time Burlingame has been their home. His health had steadily declined for the past several weeks and very many old and new-made friends regret the passing of this good man. Funeral services were held at the Presbyterian church on Monday afternoon conducted by his pastor, Rev. W. O. Davis. The deceased was a member of Lodge No. 9, A. F. & A. M. of Burlingame were present and conducted the burial service. The members of E. P. Sheldon Post, G. A. R. of which he was a member also were present and assisted in the service. The following relatives were here to attend the funeral: Mr. George Perrill and sister; Mrs. Emeline Todd of Salina; a niece and nephew, Mrs. Adelide Muir and Albert Todd, also of Salina and Mr. and Mrs. Crumb of Osage City. The funeral of Mrs. Peterson was preached by Rev. READER at the M. E. Church Friday fore noon at 10 o'clock, and the remains were interred at the I.O.O.F. Cemetery. The daughters of Rebekah conducted the services at the grave. Many of her friends and relatives followed her remains to their last resting place. Rebecca Virginia HARRIS was born in Montgomery County, Indiana, 15 September 1842; was married to Frank W. DAVIS 16 February 1852. One child was born to them-- Frank-- 26 June 1864, 5 October 1893, Mrs. DAVIS was married to W. P. PETERSON; united with the M. E. Church in 1863; joined Daughters of Rebekah at Ladoga in 1885; Died 26 December 1900. While in meekness and sorrow we bow to the "divinity which shapes our ends". We yet deplore the sad calamity which so suddenly terminates her earthly labor and brought the eternal reward due to noble womanhood and christian [sic] character and we still may say, "Thy will be done". We also share with the husband and son, family and friends in their sorrow and sad bereavement, as with them we all look unto him for that "Peace which passseth [sic] all understanding". John E. PETTICORD was born 25 August 1879 and died 15 September 1905 at Indianapolis. He leaves to mourn his ultimate death a devoted father and mother, three brothers, Walter, Chester and LaRose, and two sisters, Pearl and Bessie, besides a large circle of friends. The funeral was held at the New Ross Christian church Sunday afternoon, Wm. PETERSON officiating. After the services the remains were laid to rest in the beautiful I.O.O.F. cemetery south of town. The deceased spent most of his boyhood days in the vicinity and while his death was not unexpected it came as a throb of sorrow to the community. James Piersol, sixty-eight years old and a life resident of Boone County, passed away at the county farm at 6:30 o'clock Tuesday morning, following an illness of three weeks. Mr. Piersol was born in Jamestown sixty-eight years ago, and had spent practically all his life in this county. He was never married. One brother O. M. Piersol, of Danville, survives him. The body was brought to Jamestown Wednesday evening, and interment was in Lowry cemetery. Henry M. PITTENGER, son of Nicholas and Emily PITTENGER, was born in Wayne township, Montgomery County, Indiana, 12 June 1843, and departed this life 5 January 1906, aged 62 years, 6 months and 23 days. He resided in and near Waynetown until 21 years of age. From the age of 21 to 26 he resided in Illinois, near Hoopeston. At the age of 26 he located in Jamestown, Indiana. In 1863 he enlisted in Co. A, 117th Indiana Volunteers and served continually until his discharge in 1864 after 14 months service. In 1870 he moved to Jefferson township, Boone County, where he has since resided. For more than thirty years he was a member of the Luther Lodge. I.O.O.F., at Jamestown. He was also a member of the Jamestown Encampment and Rebekah lodge and the G. A. R. at Advance. On 7 December 1869 he was married at Jamestown, Indiana to Mary L. CUNNINGHAM. To this union were born six children as follows: Emma J. SCAMAHORN, William F., Carrie A. MYERS, Samuel N., Claude N., Elzora E. Elzora E., the youngest child departed this life, at the age of seven years. The widow, five children, and one sister, Mrs. Louvilla QUICK, of Indianapolis, and two brothers, Frank PITTENGER, of Elmdale and William PITTENGER of Waynetown, are left to mourn his departure. In 1882 he united with the church of Christ at Carson and afterward moved his membership to the Advance church of the same denomination. Funeral services were held Sunday at 11 o’clock, conducted by Rev. HENDRICK of Irvington and Rev. NEWLIN of Jamestown. After the services at the church the remains brought to the I.O.O.F. cemetery at Jamestown for burial, the Odd Fellows attending in a body and performing the burial of their deceased brother. We desire to tender our heartfelt thanks to the kind friends and neighbors and members of the orders for their help and sympathy during the sickness and death of our husband and father. John Poland, father of Mrs. E. P. FINCH here, met his death very suddenly at Indianapolis Saturday evening by accidentally falling off a fast moving street car just as it was turning a curve, the fall breaking his neck. The car being loaded with passengers, he was standing on the mounting board and was in the act of paying his fare when the car struck a curve. E. P. and Mrs. FINCH went over there Sunday morning. The remains were brought here Tuesday morning and interment in the I.O.O.F. Cemetery. Lebanon March 27 – Thomas J. POWELL one of Boone County’s prominent pioneer citizens passed away at the Williams hospital last night at 9:50 o’clock, death being due to uremic poisoning. Mr. Powell had been suffering for more than a year but his last illness was of only two weeks duration. He was born in this county Sept 2, 1843 and was therefore 72 years, 6 months 25 days at the time of death. In Dec 1886 in this city he was united in marriage to Maria Howard who survives. Three children, Myrtle Davis, Daisy Sicks and Roxie McLaughlin, all of Indianapolis survive. One step son T. A. Howard, Chicago ; one step daughter Lyda Miller, Indianapolis ; four brothers, William Powell of Ft. worth, Tx; Dally Powell of Jireh, Wyo; Roy and George Powell both of this city and five sisters, Patsy M. Bowen of Boelus, Neb; Almirinda Williams of Harald, Texas; Mrs. M. N. Richmond of Indianapolis; Ida Stout of Thorntown and Bessie Richey of this city also survive him. Mary FLEECE- PROCTOR was born in the state of Kentucky, 5 November 1821, and died in Jamestown, [Boone Co.], Indiana, 31 July 1898. Aged 76 years, 8 months and 26 days. She came to Indiana with her father some time in the thirties [1830's] and settled near North Salem, the county was then new, she was made aquatinted [sic] with the hardships, toil and privations of pioneer life, she united with the Deciple [sic] Church 30 May 1839, and lived a faithful and devoted Christian life until that day of her death. She was married to Anthony H. PROCTOR, 28 June 1840. As the fruit of this union there were born to them twelve children of which five- three boys and two girls - survive her. Her long life was one of toil, hardship and anxiety in common with the rest of mankind, she had her shares of responsibilities of this life, but she bore them with much patience, her last sickness was long and painful for more than a year she yas [sic] confined to her room suffering greatly at times, but she was resigned to the will of her master and looked to the end as one blessed triumph through Jesus Christ. Hiram Rader a Civil War veteran passed away at the home of his son-in-law William Curtis in Marion Township at 5:10 o'clock this morning after an illness of almost a year, death being due to paralysis. Hiram Rader was born in Rush county, Ind., January 27, 1833, and departed this life September 22, at the home of his daughter, Mrs. Catherine Curtis, age eighty-two years, seven months, and twenty-five days. In January, 1853 he was united in marriage to Miss Elizabeth Knox, and to this union were born four boys and five girls. The surviving children are Mrs. Mollie Solomon of Lake county; J.C. Rader, of Kansas City, Mo. ; Porter Rader also of Kansas City; Walter Rader and Mrs. Ida Swindler, both of Hayes, Kansas; Mrs. Maggie Crockren of Kokomo, and Mrs. William Curtis of Marion township. One son, William died May 29, 1884, and one daughter, Lien Edna, died April 16, 1892. His aged companion also survives. He united with the Christian Church when a young man and has lived an upright Christian life, and was ever ready to help his fellowmen, He enlisted in the Seventh Indiana volunteers where he served with credit to himself and country for three years. He was a member of the G.A.R. Post at Aandarko, Okla., in which city he resided for eight years. The funeral service will be held Friday morning at 10:30 o'clock at Mount Zion church, conducted by the Rev. A. W. Cash, of Lebanon. Interment at Rockway [correction: should be Brockway] Cemetery. Mrs. Perlina Belle Rader who has been afflicted with Bright's Disease since last January died at 4 a.m. today at her home in Clinton Twp. aged forty-two years, eleven months and eighteen days. She was married January 23, 1881 in Lebanon to Andrew Rader. The husband and two children, Emery Earl and Goldie Ann, survive her. She leaves one brother, Charles Meenach and two sisters Alice Redenbaugh and Ida Reynolds. Mrs. Rader was a member of the Christian church at Elizaville. The funeral will be held Friday at 2 o'clock at the Union Church. Rev. Vandevort officiating. Interment at Union cemetery. Burial in the Ladoga cemetery followed last rites this afternoon at 2 o'clock at the Russell and Hitch funeral home for Walter B. Rader, 84, who died Saturday at the Suddarth Nursing Home in Indianapolis. Rev. Wilber Sharp was the officiating minister. A native of Boone county, Mr. Rader made his home at 522 West Washington street before entering the nursing home. He had been in poor health one year and seriously ill the past five months. He was the son of Hiram and Elizabeth (Knox) Rader, born August 21, 1870, and was the last of a family of nine children. He was married 63 years ago to Lillie Rodgers, who died in 1909. 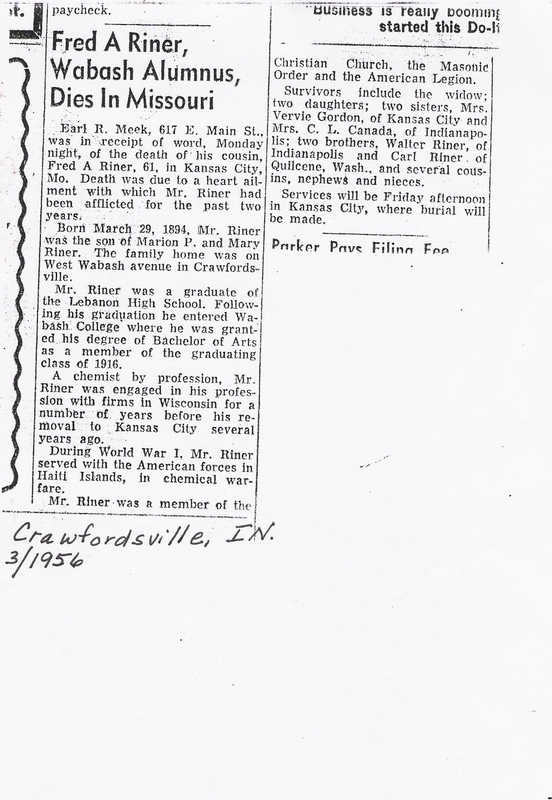 Mr. Rader had resided in Boone county his entire life and was a painter and decorator by trade. He is survived by four daughters, Mrs. Harvy Dean, Mt. Henry, Ill., Mrs. Ola Walton of Lebanon, Mrs. Love Harshbarger, Ladoga, and Mrs. Cora Brown of Indianapolis; two sons, Hubert R. of LaPorte and Samuel P. Rader of Crawfordsville; 17 grandchildren and several great-grandchildren. A daughter is deceased. LEBANON -- George W. Ragsdale, 51 years old a farmer in Harrison Township died of heart disease. Mrs. Maggie Ellen RAGSDALE, wife of James RAGSDALE, died at 6 o'clock Monday night at her home in Union Township, Hendricks County, one and one half mile east of Lizton. She was the daughter of Samuel HILAND and wife and was born in Jackson township and was aged nineteen years, four months and six days. Her marriage occurred 8 January 1904 in Harrison township. One sister, Mary HILAND survives her. She was a member of the Christian church at New Brunswick, where the funeral was held at 10 a.m. Wednesday Rev. SMITH officiating. Burial at Old Union cemetery. Note: I am posting this obituary for others. I am not related to the subject. No other information was given. Calculated birth date: Friday, 16 Jul 1886. Mrs. Mary C. Ralph, 70 years old, widow of Benjamin Ralph, is dead at the Soldiers' Home. She was admitted from Lebanon. Indianapolis, Ind., Oct 16 -- The body of Samuel M. Ralston lay in simple state today at his country home near Indianapolis, where for months he fought a losing battle to regain his health. Private funeral services are to be held at the Ralston home tomorrow morning and the body will be taken to Lebanon, Ind., Ralston's former home, for services that afternoon in the Lebanon Presbyterian church, followed by burial in the Lebanon cemetery. Some 40 years ago down in Boone County, Indiana, there was a little schoolhouse where assembled day by day a group of pupils regarded as rather thoroughly roughneck. A young teacher appointed to the school was regarded as eminently fitted for the post because he was six feet tall and molded well. As was to be expected, trouble developed, and the young teacher lived up to expectations by soundly thrashing one of his pupils. Bub the pupil, resenting thus having been beaten at his own game, started suit against the teacher. The teacher did not have any money to hire a lawyer. So he went into court and defended himself. He won again. What the pupil did then is not recorded, but the young teacher, whose name was Samuel Moffet Ralston, began to study law. By and by he became a lawyer and pretty soon he entered politics— the old school of politics, the same school from which the late Thomas R. Marshall was graduated, an evenminded school of men, not given to demagoguery, fierce invective and cheap chicanery. Conservative and thoroughly regular— that was the old school. His first ventures in politics were not encouraging. In 1888 he was defeated for State Senator. In 1896 and 1898 he was defeated for Secretary of State of Indiana. In 1908 his good friend Tom Taggart tried to nominate him for Governor. But other Democrats revolted, trying to unseat Boss Taggart. They deadlocked the Convention, which finally turned to a compromise candidate—Thomas R. Marshall. In 1912, when Marshall was running for Vice President, Ralston tried again and succeeded. It is generally admitted that he made a very able Governor. He helped to bring Indiana's finances up out of a sea of debt in which they had been floundering for years. Ten years later came his second chance. He was nominated for Senator, as a Democrat of course. Albert J. Beveridge had just defeated Senator Harry S. New for the Republican nomination. The disgruntlement of the New men helped to weaken Beveridge in the campaign and Ralston won. After that Ralston had few ambitions. He virtually turned down a nomination for President last year, as the deadlock between McAdoo and Smith broke up in the Democratic Convention. He ordered his name withdrawn as votes began to pile up for him. This is the story of Samuel M. Ralston's rise in politics. His departure from it was equally dignified and calm. Since early in September he had been ill with uremic poisoning. He recognized that he had not long to live; so he bade his family and friends good-by last week at his bedside in his Indianapolis home and one morning slipped into unconsciousness. Twenty-two hours later he died. They buried him quietly but with honors, at Lebanon, Ind., his old home. From the Senate standpoint the death of Senator Ralston is important. It means the loss of a Democratic vote, for Governor Jackson of Indiana is a Republican and will appoint one of his party to the vacancy. Conjecture has veered in many directions, the nationally known names mentioned being those of Albert J. Beveridge, onetime Senator; Everett Sanders, Secretary to the President and former Congressman; Will R. Wood, Representative and Chairman of the Republican Congressional Committee. John M. Randel, a pioneer resident of Boone County, died at 11:30 a.m. Sunday at his home, 502 West Main Street. Heart disease was the cause of his death. He was ill ten days. Mr. Randel was born near Ladoga and was 80 years of age. He was a charter member of the Christian church at Dover and had continued his membership there since that time. He was a deacon in the church for several years and then an elder until his death. He was married in 1870 in Montgomery County to Louisa E. McDaniel who passed away November 11, 1926. Surviving are a daughter, Mrs. Mollie LaFollette, a grandson, Argyle LaFollette, and a sister, Mrs. Henry McDaniel of Lebanon. A grandson, Searle LaFollette, three brothers, Andrew, George and James Randel, and two sisters, Sarah Stark and Mary Stark, are deceased. Besides being a member of the Christian church of Dover, he was identified with the Knights of Pythias lodge at Shannondale. The funeral will be held at the Dover Christian church at 11 a.m., Tuesday, the Rev. Ora McDaniel of Advance officiating. Burial will be in Dover cemetery. Mrs. Louisa Ellen Randel died at 2:30 a.m. Thursday, at her home near Dover, of a complication of diseases. She had been ailing for 10 years and has been bedfast since June 1 of this year. Mrs. Randel, born in Montgomery county, April 1, 1851, has been a resident of Boone County since 1872. 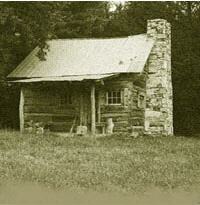 She had lived at the present homestead near Dover for the past fifty years. She was married August 31, 1871, in Montgomery County, to John M. Randel, who survives. She leaves an adopted daughter, Mrs. Mary LaFollette. Alonzo Nay made his home with the Randel's from the time he was fifteen years of age until he was 21. One grandson, Argyle LaFollette, survives Mrs. Randel. One grandson, Searle LaFollette, died July 8, 1926. Mrs. Randel also leaves one sister, Martha Gregory, of Ladoga, and three brothers, James A. McDaniel and Henry McDaniel, both of Lebanon, and Samuel McDaniel, of Wichita, Kansas. Mrs Randel was a member of the Christian church at Dover and served as a deaconess in that church for thirty five years. The funeral will be held at 10:30 a.m. Saturday at the Christian church at Dover, the Rev. Ora McDaniel, of Advance, officiating. Burial will be in Dover Cemetery. Albert H. RAWLINGS, son fo [of] Moses H. and Martha J. RAWLINGS living near Montclair died Saturday night, 26 November, aged 28 years, 6 months and 26 days. For about fifteen years he had been afflicted with spinal trouble but the immediate cause of his death was heart trouble. He was a brother of Mrs. Henry LEACH living south of Jamestown. Funeral services were held at the Montclair church Tuesday at 10 a.m. conducted by Rev. MOORMAN of Danville, Burial at North Salem. * Note from Janet ISLEY Price, I am posting this obituary for others. I am not related to the subject. Calculated birth date: 30 Apr 1879. Mrs. Martha REESE, wife of Clem REESE, died Wednesday at her home north east of Old Union Church of cancer with which she had suffered for some time. She was forty-five years of age and the mother of three sons, Harry, Elisha and Roy. Harry is serving a term of enlistment in the U.S. Navy and is stationed on the waters off the coast of Massachusetts. At the time of going to press no arrangements had been made for the funeral as no word had been received from Harry whom they expected to come home. Note: I am posting this obituary for others. I am not related to the subject. Lebanon, March 14 – James RICHEY a pioneer resident of Mechanicsburg and a veteran of the Civil War passed away this afternoon at 1:45 o’clock at his home on the Lebanon Road out of Mechanicsburg after an illness of a complication of diseases. He was born on April 18, 1839 on the farm on which he lived and died and on which his father, the late John Richey settled many years ago. In June 1867, he was united in marriage to Anna Olive in Lebanon and to this union were born 8 children, 5 boys and 3 girls. Deceased was a member of rich Mountain post GAR of Lebanon and was a volunteer a member of the 72nd Indian regiment Co G serving valiantly throughout the war. He was known as a good and obliging neighbor and was loved by many. Mary F. Riley, 99, Nebraska pioneer, died early Sunday at the home of her daughter, Mrs. Ralph D. Currier, 5210 Leighton avenue, after a year's illness. She was the widow of the late Madison J. Riley who came from Lebanon, Ind., to settle in Madison county in 1883. Thirty-six years ago they moved to University Place. Mr. Riley, a Civil war veteran, died in 1922. Altho [sic] nearly a century old Mrs. Riley, until her illness, was active in organizations of the First Methodist church and in the Wesleyan woman's educational council. She was also a member of the W. C. T. U. and the Belknap Relief corps. Mrs. Riley experienced four wars in her lifetime. Her girlhood home was in southern Indiana, the section terrorized by guerillas during the Civil war. Her son, Walter M. Riley, was a member of the First Nebraska volunteer infantry during the Spanish-American war and died at Malolas in the Philippines. Three grandsons were in World war I while three grandsons and one great grandson are in the present conflict. Besides Mrs. Currier, Mrs. Riley is survived by another daughter, Mrs. C. L. Ward of Lincoln, 10 grandchildren, 15 great grandchildren and one great grandchild. Funeral services will be from Roper and Sons' chapel Tuesday at 1 p.m. and burial will be in Wyuka. The family requests no flowers. Jess Wade RINEHART, 75, retired farmer, passed away Sunday at his home in Rochester. He is survived, by his wife and 4 daughters. The funeral was last Wednesday at the Christian Church at Rochester and burial was there. Mr. Rinehart was the brother of the late Mr. W. D. Rinehart and uncle of Mrs. Olive Lough of Waveland. Mrs. Laura L. RINEHART, 995 of Waveland died at 2 p.m. Sunday in Culver Hospital, Crawfordsville. She had been seriously ill 15 days. Mrs. Rinehart, who had lived here since 1905 and was believed to have been the oldest resident of this community, was born August 13, 1866 in Boone County. She was one of several children born to Robert S. and Mary Dooley Irwin and was the last survivor of the family. She married Wilder D. Rinehart Oct 28, 1888 in Boone County. Mrs. Rinehart joined the Pleasant View Church near Lebanon at 16 and later moved to Waveland and became a member of the Methodist Church and WSCS. Her only survivors are a daughter, Mrs. Olive Myers of Waveland and several nieces and nephews. Funeral services were conducted at 1:30 p.m. Wednesday at Machledt & Servies Funeral Home with Rev. Fred Dean officiating. Interment in Oak Hill Cemetery, Lebanon. Wilder RINEHART was called to Lebanon this week by the critical illness of his mother, Mrs. Nancy Rinehart, who suffered a paralytic stroke on Sunday. She died Wednesday evening. Funeral services will be held today. She was in her 89th year. Carl Riner, 75, former local resident, died Thursday, March 3, at the home of his daughter, Mrs. Barbara Jean Getz of Quilcene, Wash.
Mr. Riner was born near Advance the son of Marion P. and Mary Meek Riner. He was married to Beulah Huber of near Thorntown. She preceded her husband in death in 1937. The survivors include the daughter; a sister, Mrs. Vervie Gordon; a brother, Walter Riner of Indianapolis; a granddaughter, and several nieces, nephews and cousins. Mr. Riner was a member of the North Christian Church and the Masonic bodies in Advance. Funeral services and cremation took place in Quilcene. Earl R. Meek, 617 E. Main St., was in receipt of word, Monday night, of the death of his cousin, Fred A. Riner, 61, in Kansas City, Mo. Death was due to a heart ailment with which Mr. Riner had been afflicted for the past two years. 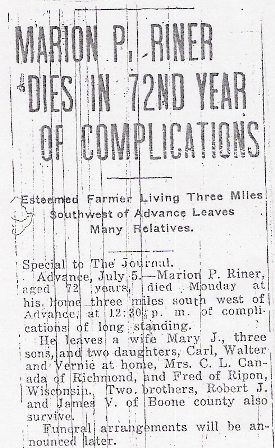 Born March 29, 1894, Mr. Riner was the son of Marion P. and Mary Riner. The family home was on West Wabash avenue in Crawfordsville. Mr. Riner was a graduate of Lebanon High School. Following his graduation he entered Wabash College where he was granted his degree of Bachelor of Arts as a member of the graduating class of 1916. A chemist by profession, Mr. Riner was engaged in his profession with firms in Wisconsin for a number of years before his removal to Kansas City several years ago. During World War I, Mr. Riner served with the American forces in Haiti Islands, in chemical warfare. Mr. Riner was a member of the Christian Church, the Masonic Order and the American Legion. Survivors include the widow; two daughters; two sisters, Mrs. Vervie Gordon, of Kansas City and Mrs. C. L. Canada, of Indianapolis; two brothers, Walter Riner, of Indianapolis and Carl Riner of Quilcene, Wash., and several cousins, nephews and nieces. Services will be Friday afternoon in Kansas City, where burial will be made. Dr. Riner was born in Madison Co., West Va. August 14, 1823 and died August 23, 1896, aged 73 years and 9 days. HE REMOVED WITH HIS PARENTS FROM HIS PLACE of birth at the age of six years to near Frankfort, Franklin Co., Ky. where he resided until the age of manhood, following the occupation of farming. He was married to Angelina Gibson of Pleasureville, KY in 1849. From this union, four children were born: Mary F., Marion P., Robert J. and Jane V. His companion died Feb. 21, 1871 and on June 7, 1874 he was married to Susie A. Davis, who departed this life April 27, 1883. At the age of sixteen the deceased joined the Christian church at Clear Creek, Ky. thence to Providence church on coming to Indiana. He removed from his home in Ky. in 1851 to Montgomery Co. Ind. and from there to Boone Co. where he lived until his death removed all that is mortal of him. Funeral services at Advance. Advance, July 5 -- Marion P. Riner, aged 72 years, died Monday at his home three miles south west of Advance, at 12:30 p.m. of complications of long standing. He leaves a wife Mary J., three sons, and two daughters, Carl, Walter and Vernie at home, Mrs. C. L. Canada of Richmond, and Fred of Ripon, Wisconsin. Two brothers, Robert J. and James V. of Boone county also survive. Mrs. Mary J. Riner, 75 years of age, a resident of Boone county many years, died Saturday afternoon at two o'clock at Kansas City, Mo., where she had been residing since last June. Her death was attributed to complications following an illness of ten days duration. Mrs. Riner was born in Montgomery county, a daughter of William and Mary Jane (Walkup[?]) Meek. She was married in 1880[?] to Marion P. Riner, who passed away in 1926 [note: submitter of obituary states Marion Riner died July 4, 1927]. Since the death of Mr. Riner, she had made her home with her children. She was a member of the North Christian church in Advance. Survivors are five children. Vervie Ethel Gordon, of Wisconsin; Gordon Carl Riner and Fred A. Riner, of Kansas City, Mo; Hazel Fern Canada, of Terre Haute, and Walter Riner of Indianapolis. Two brothers, Newton H. Meek, and Merton Meek, are deceased. The body arrived Sunday afternoon and was taken to the Bratton Brothers funeral home where services were held this afternoon at 1:30 o'clock. The Rev. John Clark of Advance, officiated and burial was made in Oak Hill cemetery. Word of the death of her brother, Jesse ROARK at Waterville, Washington was received by Mrs. J. I. Slater, 1501 W. Wabash Avenue here Friday evening. Mr. Roark was principal of the grade schools of Waterville, where he had lived and taught for several years. He was born in Boone County near Dover, Sept 4, 1875 and lived most of his life in that vicinity. A son, Lloyd B. Roark of Fort Wayne and a daughter, Mrs. Lucille Purcell of Indianapolis survive besides the sister. Mrs. Slater said Friday evening the body would probably be brought back here and buried in the family lot at the Dover cemetery. Jamestown, July 30 – Frank A. ROBBINS, living one mile north of Maplewood, dropped dead on the farm of Henry Bowman, south of Pittsboro Friday afternoon at 2:35 o’clock while engaged in thrashing oats. Mr. Robbins was driving a wagon filled with oats when the harness on one of the horses became unfastened. As he started to get off the wagon he suffered the fatal heart attack. He was dead when reached by fellow workers of the Sam Pratt trashing outfit of Jamestown. The deceased was born in Hendricks Co on June 22, 1879 and was a son of George and Elizabeth Robbins. Mr. Robbins lived in Jamestown for a number of years where he was engaged in the livery stable and later garage business. He left here in 1917. About 6 months ago, Mr. Robbins moved to the Maplewood farm from Mace where he had been engaged in the restaurant business. He was a member of the Pittsboro Christian Church and Masonic and IOOF lodges. Mr. Robbins is survived by his widow, who was Miss Retta Hurt of Max; one son, Byron, two brothers, Ross Robbins of Jamestown and Carl Robbins of Indianapolis and two sisters, Mrs. John Gray of New Winchester and Mrs. Ollie Mahan of North Salem. Funeral services will be conducted at the Pittsboro Christian Church Sunday afternoon at 2 o’clock. Jamestown - - Double pneumonia claimed the life of Mrs. Sallie ROBBINS, Friday morning. Mrs. Robbins was 63 and was the wife of William Robbins who resides west of here. She moved to this place from near Danville, Indiana when about 12. Mrs. Robbins had been very ill for about 8 weeks but bore her sickness patiently. She leaves a husband, 3 sons: Charles, Oscar and Edgar and two daughters, Mrs. Josephine Shelly and Mrs. Lydia Jones of Danville. Leonard, 19 month old son of Mr. and Mrs. Walter ROBERTS living northeast of Mechanicsburg and south of the Sugar Creek Church south of Frankfort, was fatally scalded Saturday afternoon. The child’s mother filled a bucket with hot water to scald a chicken and in an instant the infant turned the vessel. The hot water completely covered the upper part of the child’s body and one limb. The child lingered until 9:30 o’clock Sunday morning when death occurred. The funeral service was held Tuesday afternoon at 2 from the residence conducted by Rev. William Fulton of Lebanon. Interment in Buntin Cemetery. Lebanon, Ind., May 3 -- William H. H. Roberts, a prominent citizen of Boone County and a member of the Thirtieth Indiana Regiment during the civil war, is dead at his home in Whitestown at the age of 90. Mr. Roberts served in the civil war under Col. Robert G. Ingersoll, the noted agnostic, in the Eleventh Illinois Cavalry. The following children survive; Mrs. Caroline Lucas, Whitestown, Ind. ; Mrs. Emma Roberts Grendthwait, Mrs. Myra Kadow and John Roberts, Chicago; Miss Mayme Roberts, Indianapolis. Funeral services will be held at the home here and burial will be made tomorrow at Indianapolis in Crown Hill Cemetery. Son of Thomas L. & Nancy J. Robey born in Hamilton Co., June 4, 1856 and died Jan 28, 1915. Went with parents to Missouri but returned with them in 1861. Married Mary A. Poor Oct 31 1878 - 2 sons and 2 daughters born. The girls died in infancy. The sons, Bert and George, and the mother survive. Another loved one has left this world with it's sorrow, cares and woes far behind and has gone to the Land of Rest beyond the skies, where all shall be peace and love to those who have obeyed the great King's command. Aunt Katie Rogers, who has been living with her son Thomas, south of New Ross about two miles, for a number of years, died Sunday about 12 o'clock at the mature age of 83. Rev. W. T. Brooks of Ladoga conducted the services at the house Monday afternoon at one o'clock, after which her remains were laid to rest forever in the Inloe cemetery. Aunt Katie came from Kentucky in her childhood and has lived here ever since. She was a kind old lady and was loved and respected by all who knew her. She seemed not to care for her own welfare, but for that of others. She leaves a son and daughter who greatly mourn their loss, three grandchildren who shall miss her tender care, and a host of friends who shall greatly miss the aged one who has been a mother to us all. Her soul is safe in Heaven"
Jonathan Rose, an old respected citizen and one of the earliest settlers of Boone county, died at Lebanon, the other day, aged eighty-two years. John B. Routh, 46 years old, treasurer of Boone County, is dead at his home in Lebanon of Bright's disease. The widow, a son and a daughter survive. Mrs. Sadie Ruede, wife of Charles Ruede, of this city, died of consumption last Friday morning. The funeral services were conducted Sunday morning at the Christian Church by Rev. Lane, after which the remains were laid away in the new cemetery. Martha BECK SANFORD, daughter of Solomon and Elizabeth BECK, was born at Liberty, Indiana, 12 November 1823. When five years of age her parents moved near Becksville. She was married to George SANFORD in 1847 with whom she lived happily. To this union were born seven children - Mary E. STANCEL, Sarah J. STEVENS, R. W. SANFORD, Nancy E. LANE, W. J. SANFORD and Eliza M. EVANS. Her daughter ELLA died in 1879. Mrs. SANFORD died at her home in New Ross, Sunday shortly before midnight, 11 February 1906. The funeral occurred at the Christian church, the 13th at 10:30 o'clock, Rev. Hendrick conducting the services. Interment at Pisgah cemetery. Mrs. SANFORD had been a member of the Disciples church for many years and in all the relations of life was kind hearted, christian [sic] woman. She was a great lover of flowers and surrounded herself with them. Her home for a number of years was the home of the ministers of her church. She was a woman loved and esteemed by all who knew her, and she will be greatly missed by the entire community. Mrs. Elizabeth SCAMAHORN died at her home one mile north of Jamestown, Wednesday, 7 June, after a long illness of several years duration, aged 61 years, 11 months and 23 days. [Her birth date would be: Wednesday 14 June 1843] She leaves a husband, James SCAMAHORN, and five children as follows: Wm. McGILL; Mollie COYLE, of Fithian, Ill.; Frona TRAMMEL and Ora and Lillie SCAMAHORN, of Jamestown. The first two children are by a previous marriage. Mrs. SCAMAHORN was a member of the Methodist church and lived a conscientious christian [sic] life, and although she was almost helpless invalid for several years she always had a smile and a pleasant word for all. She bore up under her pain and suffering as only a Christian woman can, and now she is resting with the Father, where all is peace and joy and happiness. Funeral services were held at the house yesterday afternoon at 1 o'clock. Rev. DAUGHERTY officiating. Interment at FULLEN cemetery. Note: I am posting obituary for others. I am not related to the subject. I included the birth date by calculating with my PAF Date Calculator. No other information was given. Frank Schumake, an older soldier, who has been afflicted for some time with dropsy, died at his home in north part of town early this morning. Transcriber Note: This was typed as written, nothing was changed. The above was written by Mr. Scott some time prior to his death, and in anticipation of that event, as he had been in very poor health for several years past. In fact more than a year ago it was not thought possible that he could live but a very short time. Consumption was the dreaded disease with which he had to contend. He died January 6th, 1901. His wife survives him. No man in our town was held in higher esteem then was Elisha Scott. In his death the community loses a good citizen. Note: "Brother of James Wesley Scott (see obituary) and Green B. Scott, b. 1836, Boone Co. Indiana, my ggg-grandfather." The death of James G. SCOTT Wednesday, who lived northeast of town, came as a great shock to his family, a great surprise to his attending physician and his many neighbors and friends. He had been sick with what was pronounced and with every symptom of typhoid fever for about two weeks, and was, the first of this week, improving nicely and showing every indication of recovery up to the very hour of his death. But, Wednesday, near the hour of 2 o'clock, the family were out of the sick room for a short time, and when they returned, they found him still and with out [sic] signs of respiration. The physician was summoned, but the spirit had quietly and peacefully taken its flight. The deceased was a well respected citizen and leaves a wife and two children to mourn him. Funeral services will take place tomorrow [Friday]. James Wesley Scott aged 65 years, died 2-14-1903. He was born in Boone county , IN in 1838 and at the age of 13 he came to Missouri. At the age of 18 he married Angeline Webb. To this union was born 9 children, of which four survive him. Angeline died 2-17-1886. He afterward married Rosa Rector. To this union was born three children, two of which survive. Note: "Brother of Elisha Scott (see obituary), and Green B. Scott, b. 1836, Boone Co. Indiana, my ggg-grandfather." Columbus Sedwick, a native born citizen of Union Township, died at 5:30 a.m. today, at his home near Rosston, at the age of 85 years, 3 months and 15 days. He had been in failing health for the last four years. Columbus Sedwick was born March 16, 1837, on a farm adjoining that where he lived and died. He was a son of Simon and Phoebe Sedwick, both deceased. The only near relative surviving is a sister, Miss Sidney Sedwick, who lives with him on the home place. He served in the Civil War as a member of the 10th Indiana Volunteer Regiment, Company K.
The funeral arrangements had not been announced when the Pioneer went to press. Lebanon: After two years’ illness, during which time she had been a helpless invalid, Myrtle SELLERS passed away this morning at 1:25 o’clock at the home of her parents, Clinton and Mary E. Gamble 208 E. Busby Street death being due to a complication of diseases. Deceased was born in Hendricks County June 22, 1894 and was therefore 21 years six months and 13 days old when she answered the last call. March 5, 1908, she was united in marriage to Basil Sellers who with two children Mary Elizabeth and Helen Nora survive. One brother, William Gable of Hamilton County, four sisters, Ethel Cummings and Nora Harris of this county, Melvina Harris of Sheridan and Nellie Gamble of this city also survive. She had lived in this city of the last 4 years and previous to that time had lived in Crawfordsville. The funeral will be held at 10 a.m. Friday at the residence on Busby Street conducted by the Rev. K. W. Robbins of the Methodist church; burial in Oak Hill cemetery. Patrick Shannahan, one of the best known citizens of the county, died at 6 o'clock Saturday Morning at his home two miles east of Advance of cancer of the stomach. Mr. Shannahan was a native of Ireland where he was born seventy three years ago. He came to this country in 1858. He is survived by two children Dennis, who he has been living with him on his farm near Advance and Mrs. Jennie Broghard, of near Fair Oaks, Indiana. His wife died almost ten years ago. Mr. Shannahan was a member of Saint Joseph's Catholic Church of Lebanon where the funeral was conducted Monday at 10 a.m. by the Rev. J. F. Connelly. Interment at the Catholic Cemetery, Lebanon. Mrs. Esta G. Shannon, 81, well known Lebanon resident who owned and operated a hat shop for many years, passed away Monday afternoon at Oak Park Manor Nursing Home. She had been in poor health five years in the nursing home since April of 1972. Mrs. Shannon had resided most of her life in Lebanon and had a millinery until 1954 located on West Washington next to her husband's barber shop. She worked at Lord's from 1954 until she retired in 1966. She was an active, dedicated member of the Central Christian Church of Lebanon, a member and Past Worthy Matron of the Lebanon Chapter, Order of Eastern Star, and a member of the Ace Hi Bridge club. She attended schools in Montgomery County where she was born September 9, 1891, the daughter of William Frank and Nora (Hall) Stark. She was married June 9, 1912 in Boone County to William Harrison Shannon, a Lebanon barber for many years, who died March 28, 1972. Surviving are a daughter Mrs. Kay Morris of Lebanon and two children. A daughter Opal Irene died in infancy and a niece Opal Tout Petticord, who was reared in the Shannon home, also is deceased as is a brother. Last rites are scheduled for 1:30 p.m. Thursday at the Russell and Hitch Funeral Home in Lebanon with burial to follow in Dover Cemetery. Rev. Fred Sharp will be the officiating minister. Friends may call at the funeral home beginning 7 o'clock this evening. Opal Irene Shannon, age 2 years, 2 months and 21 days, daughter of Harrison and Esta Shannon, 407 N. East Street died at 7 a.m., today of tubercular meningitis after a several weeks' illness. The funeral will be conducted tomorrow afternoon at 3:00 at the home of the parents by the Rev. Homer Dale. A well known Lebanon barber for 45 years, William Harrison Shannon of 420 North Park Street, passed away Tuesday night at Witham Hospital. The 82-year old resident had been in poor health for several years. Mr. Shannon attended schools in Kentucky and came to Boone County in 1909. He was a graduate of Barber College in Indianapolis. He joined Clarence Coggswell in partnership in the Star Barber Shop, which they owned and operated beginning in 1925. Mr. Shannon retired in 1956. Prior to that he barbered on Superior Street. He was a member of the Central Christian Church. A native of Nicholas County, Kentucky, Mr. Shannon was born July 9, 1889 the son of John Will and Rushia (Hensey) Shannon. He married June 9, 1912 in Boone County to Esta G. Stark, who survives. In addition to the widow he leaves one daughter, Mrs. Kay Morris, Lebanon; a brother Hobart Shannon of Carlisle, Ky.; one sister, Mrs. Mattie Dampier of Higginsport, Ohio; and one grandson. Also several nieces and nephews survive. A daughter, Opal Irene, died in infancy and a niece, Opal Tout Petticord, who was reared in their home, is deceased. A brother and three sisters also preceded him in death. Last rites are set for 3 p.m. Friday at the Russell and Hitch Funeral Home with the Rev. Fred Sharp officiating. Burial will be in the Dover Cemetery. Friends will be received at the funeral home beginning 7 o'clock this evening. The funeral of Mr. John SHELLEY who died at her [sic] home two miles east of Advance Friday of pneumonia was held Sunday morning at 10 o’clock at the residence. Rev W. W. Speer pastor of the Advance Methodist Church officiated. Interment was in IOOF Cemetery at Jamestown . Thorntown—Clarence H. Shau, 79, Rt. 2, died at 7:50 a.m. Friday in a hospital at Logansport of complications following pneumonia. He was critically ill since July 24. Mr. Shau was born in White County on March 7, 1891 to Peter Sanford and Matilda Keever Shau. On Feb. 15, 1912 he was married to Martha Ellen Boots in Crawfordsville. She died in 1944. Mr. Shau lived on a farm near Thorntown for more than 50 years. He grew up in Tipton and Kempton and attended schools in Tipton and Cicero. Survivors include three daughters, Mrs. Oren (Jeneva) Miller of Thorntown, Mrs. Gerald (Jean) Dale of Thorntown and Mrs. Robert E. (Catherine) Cross of Kokomo; two sons, Clarence (Ted) Shau Jr. of Florrissant, Mo., and Robert S. Shau of Lafayette; 11 grandchildren; eight great-grandchildren and nieces and nephews. He was preceded in death by a daughter, Marybelle, two brothers, and two sisters. Services will be conducted at 10 a.m. Monday in Russell & Hitch Funeral Home at Thorntown with Rev. Don Blake officiating. Burial will be in Cox Cemetery. Friends may call at the funeral home after 7 p.m. Sunday. Caleb Franklin Shera, 81, Route 4, died at his home seven miles southwest of Lebanon, at 2:15 a.m. today. Mr. Shera had been a farmer his entire life and was born and had lived all of his years in the same neighborhood. He had been seriously ill only four days. Born in Boone county, September 8, 1875, he was the son of Thomas and Josephine (Jett) Shera. He was married in Lebanon May 19, 1901, to Icy Rader who passed away May 5, 1931. Mr. Shera was a member of the North Christian church of Advance. Surviving are one daughter, Mrs. Buren Ailes, Route 4; one son, Rex Shera of Indianapolis, and one sister, Mrs. Daisy Dale of Lebanon. He also leaves three grandchildren, Karen Shera, Mrs. Wendell Dickerson and Tom Ailes and one great grandchild, Denise Dickerson. One sister is deceased. Funeral services will be held at the Russell and Hitch funeral home in Lebanon at 1:30 p.m. Thursday. Rev. Raymond Duff will be officiate. Burial will be at Old Union cemetery. Friends may call at the funeral home after 7 o'clock tonight. Mrs. Icy May Shera, age 51 years, passed away at the Williams hospital this morning at eight o'clock from a complication of diseases. Mrs. Shera was born in Boone county, the daughter of Mr. and Mrs. William M. Rader, both of whom are deceased. She spent her entire life in the Ward neighborhood in this county. She was married May 19, 1901, to Caleb Shera, who survives. Surviving besides the husband, are two children, Rex R. Shera of Indianapolis and Mrs. June Ailes of near Advance; two brothers, Ona Rader and Carl Rader of Boone county; two sisters, Mrs. Pearl Williams of Lebanon and Mrs. Blanche Turner of Boone county; her step-father, Oscar J. Metzger, and a step-sister, Mrs. Ora Lawler, both of this county. Funeral services will be held Thursday afternoon at two o'clock at the North Christian Church in Advance, of which she was a member, with the Rev. Homer Dale, pastor of the Hillside Christian Church at Indianapolis, officiating. Burial will be in Old Union cemetery. Stella Ethel BROWN, daughter of W. H. and Pricilla A. BROWN was born in Montgomery County, Indiana, 18 April 1885, and departed this life 23 November 1906, aged 21 years, 7 months and 5 days. She was united with the Christian church at New Ross, and was baptized by Elder D. E. MURRAY, when but thirteen years of age, and ever after was a consistent member. She was united in marriage to John L. SHERRARD, 17 September 1902. To this union were born two children, Wanita Lorene and Buford Carrol. Her death was caused from typhoid fever, which she contracted almost six weeks ago. She was removed from her home to her father’s, that she might have better care, as they had a trained nurse to nurse her sister who was sick with the same disease. She was given every care, but in vain. She was patient and kind during her sickness, hoping to get well to care for her children, but such was not God’s will. The funeral was preached by Rev. W. D. HENDRICK of Irvington, at the Christian church at Mace and the remains were laid to rest in the K. of P. cemetery on Sunday, at Mace. The pallbearers were Frank and Joe LOGAN, Pearlie, Ernest and Charlie PATTERSON, nephew of the deceased. The honorary pallbearers were Misses Dora LINN, Valley CONNER, Ivy EDDINGFIELD, Nellie LYTTLE, Jennie MILLER and Nora BONNER, girl friends. She was a loving and faithful wife and mother, a kind and affectionate daughter. She leaves a husband, two small children, father, mother, nine sisters and five brothers, and a host of friends to mourn her loss. Note: Information about Typhoid Fever: Salmonella Typhi lives only in humans. Persons with typhoid fever carry the bacteria in their bloodstream and intestinal tract. In addition, a small number of persons, called carriers, recover from typhoid fever but continue to carry the bacteria. Both ill persons and carriers shed S. Typhi in their feces (stool). You can get typhoid fever if you eat food or drink beverages that have been handled by a person who is shedding S. Typhi or if sewage contaminated with S. Typhi bacteria gets into the water you use for drinking or washing food. Therefore, typhoid fever is more common in areas of the world where hand washing is less frequent and water is likely to be contaminated with sewage. Once S. Typhi bacteria are eaten or drunk, they multiply and spread into the bloodstream. The body reacts with fever and other signs and symptoms. morning at 5:20 0'clock at the home of a grandson, Ray Turner, near Milledgeville. He had been in failing health the past two years and his death was caused by a complication of diseases. Mr Shirley was born in Boone County, a son of Ezekiel and Julia Ann Dale, pioneer residents. He was one of triplets, the others being Mrs. Vina Neal and the sister that died in infancy. He was married December 9, 1869, to Sarah Rebecca Vidito who died May 23, 1932. He was a member of Salem church, three miles south of Lebanon. Martin of Lebanon; and five great-grandchildren, Donald, Byron and Betty Turner and Rosemary and Alberta Martin. Two children , R'Menta Turner and Nora Alice Huffman; a brother, George Shirley, and three sisters, including the triplet sisters and Mrs. Elizabeth Swope, are deceased. call until time to go [to] the funeral services Friday. Mrs. Dora E. Shoaf, 68, resident of the Shannondale community for the past 31 years, died at the Culvr [sic] hospital in Crawfordsville at 8:30 o'clock Friday morning. She had been ill for a week with a complication of diseases. Born April 27, 1873, at Fairmount, Ill, she was the daughter of Wesley and Evaline Jones Johnson. She was married to William E. Shoaf on Dec. 23, 1890. She was a member of the Darlinton Christian church. The survivors include the husband; four sons, Claude V. Shoaf of New Ross, Carl A. Shoaf of Crawfordsville, Russell O. Shoaf of Crawfordsville, and Kenneth C. Shoaf of Advance; three grandchildren; two great-grandchildren, a sister, Mrs. Etta Dalbey of Sidney, IL, and a brother Milford A. Johnson of Danville, IL. Funeral services will be conducted Sunday afternoon at [3:30?] from the Shannondale Presbyterian Church with the Rev. Ora McDaniel of Advance in charge. Burial will be at the Shannondale Cemetery. Vol.96- New Series 11, No. 15. The two-week-old baby of Charles SHOCKLEY, east of town, died yesterday morning and will be buried today by Undertaker SMITH. Orpha Eldora SHOCKLEY was born 3 February 1868, and died Sunday 4 August 1901 at 8 a.m. aged 34 years, six months and 1 day. At the age of 18 she united with the Christian Church and has since been a devoted Christian, a loving mother and a never failing wife. In 1886 she was united in marriage to Alfred E. SHOCKLEY and to them were born five children, Albertine aged 14, Mable 12, Herbert E. 10, Nellie E. 9, and Oscar C. 7, who all are left to mourn her loss. She had long been a suffer of what was thought to be that dreadful disease, consumption, but through the help of God and her never failing willpower, she never gave up until 27 May 1901, when her strength collapsed and she fell in the floor to be carried and placed in a bed by her husband, there she remained until death, covering a period of ten weeks, during which time she did not complain of any severe aches or pain. And when they knew that death was near at hand, she called her family to her bedside and gave them her motherly advice, telling them she was going home; that she had made peace with her God and was not afraid to look death to look death in the face; and the only thing she had to regret was to leave her little children, but for them to be obedient to their father and live a life that they would have nothing to regret, so when the visit her lonely grave they could say. "I have carried out mother's instructions; and some day we will meet in that beautiful land where we will part no more." And then she gave instructions as to how she wanted to be laid to rest. First she named the undertaker, Perry SMITH, as he had been so nice and they never met with out he tipped his hat and had a kind word. Next she wanted a white plush casket, and silk stocking and white slippers. Then she named all of the pall bearers: Warren JONES, Herb HIGGANS, Johnnie JOSEPH, Nathan SCAMMAHORN, Edgar DALE and Eddie LEAK. Her next request was for Callie BAILEY, Susie LEAK and Lou COSHOW to be the ones to lay her out, and the last for Kate HANCOCK to comb her hair. Then she selected the songs to be sung: "Jesus Lover of My Soul" and "There are Lights Along the Shore of Our Journey", "Blessed Are They Who Do His Commandments" was selected by the husband, and Nellie, the youngest daughter, selected "Sleep In Jesus". Then the icy hand of death was so heavy that her words were few, and she passed away at 3 a.m., 4 August 1901. A beautiful funeral sermon was preached by Elder E. F. DAUGHERTY Monday afternoon at Lizton after which the remains were interred in the Odd Fellows Cemetery at Jamestown. The funeral of Mrs. John SHULSE was preached to a very large audience at the M. E. church on last Sunday. By Elder O. C. WILSON of Crawfordsville. J. P. SMILEY, Son of Philip SMILEY a well known farmer living northwest of Whitestown died Friday afternoon. He was unmarried and about 38 years of age. James Gaylord SMILEY dropped dead Monday night at 10:20 o’clock in the Knights of Pythias lodge room in Thorntown. Mr. SMILEY had been an active participant in the evening’s Christmas festivities given in the lodge room and after the reception and entertainment had been concluded, remained with other members of the degree team for practice preparatory to a visit to Lebanon lodge No. 45, next Thursday night when they were to exemplify third rank work. While the practice was in progress, Mr. SMILEY was stricken suddenly with apoplexy and fell dead. Mr. SMILEY’s unexpected demise came as a great shock to his host of friends with whom he was very popular. Mr. SMILEY was about fifty-one years old and was unmarried. He had been a resident of Thorntown all of his life. He leaves a mother, two sisters, Minnie SMILEY and Mrs. Arthur TAYLOR and two brothers, William SMILEY and Dr. ANDERSON SMILEY. He was a nephew of General Anson MILLS, of Washington D.C. The funeral arrangements have not yet been made. Mr. SMILEY has been employed as a traveling salesman for Campbell, Smith, Richie Company, of this city; He is well to do financially. In failing health for nearly ten years, Mrs. Corda [different spelling than headline] Ethel Smith, 60, wife of Zenith Ollie Smith, passed away at 3 o'clock Tuesday morning at her home one mile west of Max. Last rites will be held at Advance East Christian Church today where Mrs. Smith held membership. The services will be held at two o'clock Burial will be in the Tld [Old] Union Cemetery. Services will be in charge of the Rev. Myrtle Baker. Mrs. Smith was born in Boone County where she spent all of her life. She was the daughter of James and Eva (Young) Golladay and was married 1 February 1900, to Zenith Ollie Smith, who survives. Also surviving are two children, Basil H. Smith and Cecil R. Smith of near Brownsburg; one brother, Harley Golladay of near Whitestown; a sister, Mrs. Bruce Burris of Advance; a granddaughter, Ruth Maurine Smith, who was reared in her home, and five other grandchildren. She has resided on the farm where she passed away for the last thirty years. Advance Jan 1 – Gideon SMITH, 78, died at his home two and one-half miles southwest of here at 6:30 o’clock Thursday evening following an illness of one week. Death was caused by complications. The dead man was born in Boone County June 18,1 853, son of Mr. and Mrs. Jacob Smith. He was married Sept 10, 1893 to Mary Sherrin who preceded him in death. He lived on a farm for the past 36 years. He is survived by one daughter, Golda R. Smith. Five sons, Jacob, John, Samuel, George and Jessie and four sister, Rebecca, Susan, Lavina and Betsy are dead. He was a member of the United Brethren Church at Max. Services will be held at two o’clock Sunday afternoon at the North Christian Church here with the Rev. Cornelius Airhart in charge. Burial at Mt. Pleasant Cemetery. Dr. W. R. Kirtley, Saturday received a message from Detroit, Michigan announcing the death of an infant daughter of Mr. and Mrs. W. E. Smith the latter a sister to the doctor. The message also stated the body would be sent to Indianapolis arriving there some time Sunday morning. Dr. Kirtley went to Indianapolis where he met his brother, Dr. L. W. Kirtley of Lebanon. The gentleman took charge of the body upon its arrival there. The remains were taken to Franklin, Indiana where interment will take place in the family lot at Greenlawn Cemetery. Elizabeth, daughter of Joseph and Eliza CAMPLIN, was born in Sharpsburg, Bath County, KY., 30 January 1830, and departed this life in peace, 31 March 1901; aged 71 years, 2 months and 1 day. She was united in marriage to Sterling B. SOMERWILLE [sic] at Sharpsburg, 31 October 1848.To them were born ten children, four of whom preceded their mother to the Better Land, and three sons and three daughters lived to care for her in her declining years, minister to her in her last illness, and follow her remains to their last resting place, beside the husband of her youth, who died 17 July 1889. The family moved to Jamestown in 1856; removed to Illinois in 1861; since which time Jamestown has been her home. She united with the Methodist Episcopal Church at the age of 14. Her attachment was very strong to the church of her choice. She was deeply interested in all that pertained to its welfare, was regular in attendance upon all means of grace, worked in the Ladies Industrial Union, attended Sunday School and teaching a class until a few weeks before her last illness. The family has lost a loving mother and the church may well say, "A Mother In Israel Has Fallen". Funeral services were conducted in the M. E. Church by the pastor, Rev. RIPPETOE, assisted by Rev. J. F. McDANIEL. The universal respect in which Mother SOMMERVILLE was held was attested by the many present to pay last respects to her memory. A large member of relatives were present also. From which none ever wake to weep"
We wish to thank our many friends for assistance and kindness during the sickness and death of out mother Elizabeth SOMERVILLE. On 31 March, The summons came and the earthly life of our sister, Elizabeth SOMMERVILLE, was ended. She entered into that rest that remaineth for the children of God. The church and Sunday school has lost a beloved sister, whose presence was a sweet benediction and whose influence inspired all with a desire to be true and more earnest workers for the Master. Therefore be it resolved, that we will ever hold in sacred memory her kind words, good deeds and unwavering faith in Jesus. Resolved, That while we bow in submission to Him who doeth all things well, yet our hearts are all filled with sorrow for the loss of one we all so dearly loved. We shall miss her bright smile, her encouraging words and faithful help. Her life was worthy of imitation. Her work is done. She has exchanged the cross for her crown . Resolved, That we tender our sympathies to her bereaved children and grandchildren and commend them to God, who is able to bind up the broken heart. Shannondale, Jan. 15- James H. Spry, 84, one on the early settlers of this locality, died at his home her, shortly before midnight Thursday, after an illness of three months with complications. He was born on March 8, 1842 at Mt. Sterling, and in 1865 his family traveled overland to near Bainbridge, where they settled. For several years they lived in a cabin in a forest clearing near Bainbridge and then moved to what is now New Ross. He established a general store there and for several years served as postmaster. While living in New Ross he married Miss Priscilla Lewis who died in 1913. During the Civil War Mr. Spry served on the home guards. He is survived by one son, Charles S. Spry of Crawfordsville and five daughters, Mrs. Louisa Garner of Indianapolis, Mrs. Mary Ellen Darrough of Shannondale at whose home he passed away, Mrs. Elizabeth Harmon of Crawfordsville, Mrs. Myrtle Cox of Crawfordsville, and Mrs. Henrietta Busenbark of Crawfordsville. One son George passed away in 1913. He is also survived by two brothers, Edward of Hammond and Pleasant of Iowa. Nineteen grandchildren and one great grandchild. Funeral services will be held at Shannondale Sunday afternoon at 2 o'clock, it was announced, and burial also at that place. Transcriber Note: "James born in Mt. Sterling, Kentucky. James is buried at Shannondale Cemetery, Shannondale, Indiana. James' parents were James E. and Elizabeth Kitchen Spry and both are from Kentucky and both are buried at Spry Cemetery, Montgomery County, Indiana. Priscilla (Prissilla) Lewis Spry is the daughter of Fielding and Tabitha Davis, both of Kentucky and migrated to near New Ross, Indiana." Transcriber Note: May contain errors, typed as is from article. Advance, March 5 – John STANTEL died at his home NW of Advance Saturday evening at 8 o’clock. He had been suffering over a year with heart trouble. He was 78 years old and had spent his entire life in this county. The funeral will be from the home Monday afternoon at 1. The Rev. Airhart will conduct the services, burial at Pisgah cemetery. Besides the widow six children survive: Willard, Cres and Snow all of Advance; Mrs. Ben Elmore of Indianapolis; Verne Stantel of Chicago and Mrs. George LaFollette of Advance. Carl R. Stark, age 68 years, a native of Boone County, passed away Tursday [sic] night at his home, 5520 Crawfordsville Road, Indianapolis. He was born in Boone County, a son of Frank and Nora (Hall) Stark, and spent his early life here. He was employed by the Fred Siess Company in Lebanon many years before moving to Indianapolis where he worked 36 years in the order department of the Gibson Company. He retired in September, 1963. Mr. Stark was a member of the Speedway Christian Church, Boone Lodge No. 9, F. and A. M., Scottish Rite, Murat Temple and Shrine. Survivors are the wife, Mrs. Helen Stark; a son, Russell C. Stark, and a grandson, Robert W. Stark, all of Indianapolis, and a sister, Mrs. Esta Shannon of Lebanon. Funeral services will be held at 10:30 a.m. Friday at the Conkle Speedway Chapel, 4925 West 16th Street, Indianapolis, with burial in the cemetery at Dover, west of Lebanon. Masonic rites will be held at the cemetery at 12 noon Friday. Friends may call at the Speedway Chapel after 7 p.m. today. Frank Stark, age 77 years, passed away Thursday evening at six o'clock at the home of his sister, Mrs. Myrtle York, 809 South Meridian street. He had been in failing health the past thirty years and seriously ill one week. Mr. Stark was born in Montgomery County, a son of James and Sarah (Randel) Stark. He spent most of his life in Boone County and was married here on December 7, 1890, to Nora Hall, who preceded him in death on August 24, 1941. He was a member of the Christian Church at Dover and the Knights of Pythias Lodge at Shannondale. He had resided in Lebanon the past twenty-five years. Survivors are two children, Carl Stark of Indianapolis and Mrs. Harrison Shannon of Lebanon: a brother, Lee Stark of Ledoga; five sisters, Mrs. Ida Otterman, Mrs. Laura Dean and Mrs. Simpson Wills of Ladoga, Mrs. Myrtle York of Lebanon and Mrs. Golda Burgess of Indianapolis and a grandson, Russell Stark, who is serving overseas with the U.S. Army. Two sisters, Mrs. Mollie LaFollette and Mrs. Letha Barnard, and two grandchildren, Opal Irene Shannon and Robert Stark, are deceased. Funeral services will be held Sunday afternoon at two o'clock at the Bratton Brothers funeral home with the Rev. Ora McDaniel officiating. Burial will be in the Dover Cemetery. Friends may call at the Bratton funeral home. Helen A. Stark, 93, Carmel and formerly of Noblesville, died Sunday, March 12, at Riverview Hospital. She was born Jan. 18, 1896 in Indianaplois, the daughter of Seymour and Margaret (Richardson) Montgomery. She had been a resident of Carmel for two years. She was a member of Eastern Star of Lebanon. She was the widow of Carl R. Stark, who died in 1964. Surviving are two sisters, Midred Gillespie and Margaret Baxter, both of Indianapolis; three brothers, Jesse Montgomery, Qimsted Falls, Ohio, Lloyd Montgomery, Indianapolis and Carl Montgomery, Norfolk, Va; and one grandson, Robert Stark, Carmel. Graveside services will be at 1 p.m. Tuesday at Dover Cemetery in Boone County. The Rev. Emmett Lee Bales will Officiate. Local arrangements are being handled by Randall & Roberts Logan Street Chapel in Noblesville. Mrs. Nora (Hall) Stark age 70 years, passed away Monday night at nine o'clock at the home of her daughter, Mrs. Harrison Shannon, 321 East Pearl Street. She had been ill since April and her death was caused by a complication of ailments. Mrs. Stark was born in Boone County, a daughter of George and Cyrenthia (Bennington) Hall. She was married at Dover, December 8, 1890, to William Frank Stark, who survives. She had made her home for several years with her children. She was a member of the Christian Church at Dover. Survivors are the husband, two children, Mrs. Esta Shannon of Lebanon and Carl Stark of Indianapolis; a sister, Mrs. Eva Miles of Lebanon, and one grandson, Russell Stark. One sister, Mrs. Mollie Green, and two grandchildren, Opal Irene Shannon and Bobby Stark, are deceased. Funeral services will be held Thursday afternoon at two o'clock at the home of Mr. and Mrs. Harrison Shannon, 321 East Pearl Street, with the Rev. Ora McDaniel officiating. Burial will be in the Dover cemetery. The body was removed this afternoon from the Bratton Brothers funeral home to the Shannon residence where friends may call. ST. CLAIR -- Virgil, age 12 years, son of Alonzo St. Clair, died Monday, Oct. 8, at Zionsville. Burial at Zionsville, Wednesday, Oct. 10, 10 a.m.
ST. JOHN -- At Lebanon, Ind., September 4, Shirley G., only child of Mrs. L. J. St. John, aged 1_ [?] and 25 days. Ada Florence (Gibbons) Stephenson, 86, of White Lane, Indianapolis, died Thursday at her home. Services were Sunday at the Harvey Funeral Home, Mooresville, with the Rev. Clarence Hopkins officiating. Burial was in West Newton cemetery. Mrs. Stephenson was born in Boone County, 03 January 1884. She married Walter Gibbons in 1903 and he died in 1947. In 1951, she married Harry Stephenson, who died in 1967. She had lived in and around Monrovia for 30 years and was a member of the Elizaville Christian Church. Survivors include seven sons; Clarence, Cecil, Ernest, Maurice, Paul, Harold and Claude Gibbons; two daughters, Anna Lucille Manchester and Virginia Handwork; 27 grandchildren; 43 great-grandchildren; one great-great grandchild; three sisters, Anna Williams, Mabel Covert and Cora Roberts; and a Brother, Jess Bailey. Frankfort -- Harry B. Stephenson, 93, father of Glen Stephenson of Frankfort, died Saturday morning in his home on Rt. 1, Sheridan. He was a life resident of Boone County, a retired farmer, and was married to Nora C. Bannon. After her death in 1947, he married Ada (Bailey) Gibbons. He was a member of Christian Liberty Church. Surviving with the widow and son is a sister, Mrs. Ida Hays of Whitestown. Ivy R. Stephenson, 83 years, 812 North West Street, Lebanon, Boone County, IN former street commissioner here for 13 years died at the Witham Hospital today after an illness of five years. Mr. Stephenson was a brick mason by trade and worked for several years at the Miller Auto Company where he retired five years ago. He was born in New Winchester, Indiana, February 21, 1876 the son of William and Clara J. (West) Stephenson. On July 8, 1903, he married the former Julia Hoover, who survives. Other survivors include one daughter, Mrs. Thomas J. Burrin, Lebanon and one son Fred, of Indianapolis by a former marriage. One grandson Thomas J. Burrin IV is a student at Walbash College. One brother and two sisters are deceased. Mr. Stephenson was a member of the Christian Church at Lebanon and was a member of the IOOF Lodge here. Death came today at 11 a.m. for the city resident who had been hospitalized since Monday. Funeral services will be held at 10:30 a.m. at the Russell and Hitch funeral Home here Monday with the Rev. George Green officiating. Burial will be in the Oak Hill Cemetery. Friends may call at the funeral home after 10 a.m. Sunday. Mrs. Jane Stephenson was born in Fleming county, Kentucky and after ten days illness, died March 14 at her home two and one-half miles northeast of Elizaville, aged 87 years. She was married October 18, 1842 to the late Jas. A. Stephenson. To this union five children were born. They are: Robert M., Nancy M., Samuel H., Mary E. Sample and William D. Stephenson. She has been a member of the United Presbyterian church at Salem for the last 44 years, and began her religious life even earlier by uniting with the church in Decatur county at an early age. The funeral was conducted at Salem church at 11 o'clock a.m., March 16, by Rev. Work, pastor of the church. Burial at Salem cemetery. Arthur STEWARD, 73, died suddenly Sunday evening at his home near Russellville. He was born Aug 21, 1885 at Jamestown, son of Isaac and Rebecca Cline Steward. Survivors include the widow, Iva, who is the telephone operator at Milligan; a daughter, Mrs. Avis Price of Indianapolis; a stepson, Thomas R. Trump of Charleston and two grandchildren. The body was taken to McGaughey & Son Funeral Home. William D. Stewart, proprietor of the new Occidental Hotel, died at 6:30 o'clock yesterday morning at his home, 151 West Pratt street, after an illness of two weeks from cirrhosis of the liver. Mr. Stewart had resided in Indianapolis for five years, having owned the Oneida and new Occidental hotels in that time. He disposed of the Oneida Hotel a year ago, and since has been operating the new Occidental. Mr. Stewart is survived by a widow, one son, Delbert B. Stewart, three brothers and two sisters. The brothers are Seymour Stewart of Whitestown, Ind., Hardin Stewart of Logansport, Ind., and Alec Stewart. Mrs. Sarah Ella Harmon of Troy, O., and Mrs. Anna Rich of Frankfort, Ind., are sisters. Mr. Stewart's funeral will be held at 10:30 o'clock tomorrow morning at the Stewart home, and the body will be taken to Lebanon, Ind., on a special interurban car at noon. Burial will be in the Oak Hill Cemetery there. Mr. Stewart was born in Boone County, Indiana, and was in business at Lebanon and Whitestown, Ind., before coming to Indianapolis. THORNTOWN Lloyd Stout, 72, 121 N. market St., died at 2:25 a.m. Tuesday. He had been born in Boone County near Dover on Dec. 22, 1890, and was the son of William C. and Ida Powell Stout. he was a member of the Christian Church at Thorntown where he had been a deacon for many years. In addition to being a deacon, he had been Sunday school secretary and a member of the official board for the church. He was a basketball player for Thorntown High School where he graduated in 1910 and later was a varsity basketball player for Indiana University. he had been clerk-treasurer of Thorntown and was at one time in charge of the Frankfort Utilities office there. A veteran of World War I, he had served overseas with heavy artillery during the war. At the Thorntown Post 216 of the American Legion, where he was a charter member, he was a past commander and had been adjutant for many years. He was to have taken office Thursday as service officer and publicity chairman. He was also a member of the Thorntown Masonic Lodge. Survivors, besides his wife, include a daughter, Miss Naomi Stout, and a son, Jack Lloyd Stout, both of Indianapolis; a brother, Ralph of Dayton, Ohio, and three grandchildren. He was preceded in death by a son, William Coolman Stout; a daughter, Barbara Jane Stout, and a brother. The funeral will be conducted at the Thorntown Christian Church at 2:30 p.m. Thursday by Rev. Don Hainer. Burial will be in Maple Lawn Cemetery. Friends may call at the Russell & Hitch Funeral Home until noon Thursday. Funeral Services will be held Saturday at 2 p.m. in Myers Mortuary for Hosea Harrison Straughan, 702 West Peral Street, who died Thursday at Witham Hospital following a two month illness. He was 66 years old. Burial will be in Oak Hill Cemetery. Rev. Fred Wolff of Marion, former pastor of the Central Christian church will be the officiating minister. Mr. Straughan, a native and life resident of Boone County, was born March 21, 1888, the son of John M. and Margaret E. (Randel) Straughan. He was married March 10, 1907 in Lebanon to Jennie Pearl Clark, who survives. He moved to Lebanon in 1929 from a farm out in the county and had been watchman at the NYC Railroad crossing on South Lebanon street for the past 17 years. He was a member of the Stewart's Chapel Church. Surviving besides the widow are two sons, Ira L. Straughan of Owen, Wis. and John S. Straughan of this city; a daughter. Dorothea Proctor, Lebanon; one half-sister, Mrs. Catherine Sanders, city; 15 grandchildren and seven great-grandchildren. Mildred A. Strughan, 87, a homemaker who was born in Lebanon, Boone County, IN, died Friday in Regency Woods, N. H.
A resident of Cocoa, Fla., Straughan moved to Florida in 1976 from Oconto, Wis.
She was a member of Community Alliance Church in Port St. John. Survivors include sons Robert Straughan, Titusuine, Fla., and Stanley Straughan, Houston, Texas; a daughter, Pat Vogel, Port St. John, 14 grandchildren and 37 great-grandchildren. Lebanon, March 18 -- John H. SWINDLER, 74, retired Boone Co farmer passed away at his home 612 W. Main Street this morning at 1 o’clock. He had been ill the past six weeks, suffering from a complication of diseases. Mr. Swindler was born in Montgomery County and came with his parents to Boone County when 11 years old. He was married Nov 19, 1882 in Boone Co to Ella Kinnear who survives. He resided on a farm until 11 when he moved to Lebanon. Mr. Swindler was a member of the Central Christian Church. Surviving besides the wife are five children: Cora, Lona and Orpha Swindler, all teachers in the South Bend schools, Robert E. Swindler of Charlottesville, Va and James A. Swindler of New Wilmington PA; two brothers, William and James C. both of near Advance and 5 sisters, Mrs. Howard Shelly; Mrs. James Fink and Miss Rosa Swindler of near Advance; Mrs. George Leek of Jamestown and Mrs. Wallace Yeager of Ladoga. Four sisters and one brother are deceased. Funeral services will be held at the Central Christian Church Saturday morning at 10 o’clock with Rev. Carl H. Barnett officiating. Burial in Old Union Cemetery. Jackson Township Woman Died Sunday After Three Weeks’ Illness. The demise of Mrs. Mary Ann Swindler occurred at the home of her daughter, Mrs. Howard Shelly, in Jackson Township at 4:40 o’clock a.m. Sunday. The deceased had been ill several years with paralysis. She was bed-fast three weeks. She was born in Montgomery County, Indiana, February 10, 1837, and was therefore aged at the time of her death, 81 years, 10 months and 12 days. The deceased was united in marriage in 1857 in Montgomery County, to the late Robert Swindler, who died in 1879. Eight children survive; John H. Swindler, James Swindler, Mrs. Howard Shelly, Mrs. James Fink, Mrs. George Leeke and Rose Swindler, all of near Advance; Mrs. W. W. Yager, of Indianapolis; and William Swindler of Williamsburg, Virginia. Five children are dead. One sister, Louisa McMullen, of this city, survives. Mrs. Swindler was a member of the Christian Church of Advance. She had made her home in Montgomery and Boone counties all of her life. The funeral services will be held from Ward Church at 10 o’clock a.m.. Tuesday, the Rev. George Henry, of Advance, is officiating. Interment at Old Union Cemetery. Ora Russell Swindler, son of James and America Swindler, died at nine o’clock, the night of February 23, 1923, at his home two miles east of Advance. He had been ill for three weeks, with a complication of diseases. Mr. Swindler was born in Boone County, Indiana, October 23, 1899, and was at the time of his death 23 years and four months of age. He was married August 12, 1916, in Lebanon, to Mabel Ann Palmer, who survives. Other relatives surviving include the widow, the parents, one child, Rosa Anna Swindler, and two brothers, Henry H., of Jackson Township, and Roy C., of Danville. Mr. Swindler has been a resident of Boone County all his life. He was a member of the North Christian Church, at Advance, from which the funeral was conducted at 2 o’clock Sunday afternoon, by Rev. George Wyatt. Interment at Old Union Cemetery.